" Meg's World Tour of the Lakes." Date & start time: Tuesday 21st June 2016, the longest day (summer equinox). 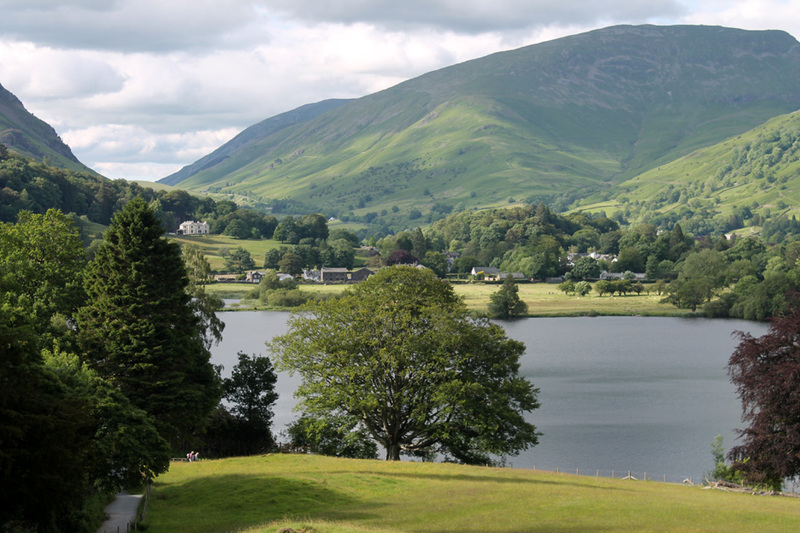 Places visited : A grand tour of many of the sights and sounds of the Uk Lake District. 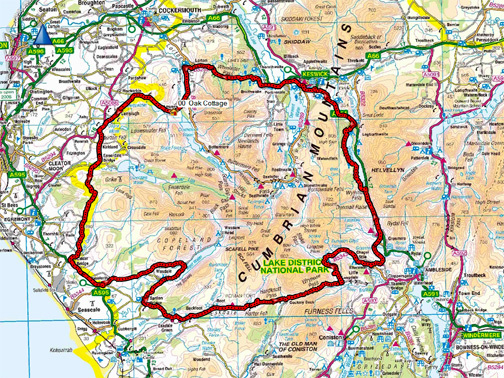 Walk details : Several local walks as we drove the 80 miles around the central fells. Highest point : The whole lot was pretty good . . . why be picky ? Walked with : Meg, Helen, Jono, Ann and our dogs, Harry and Dylan. 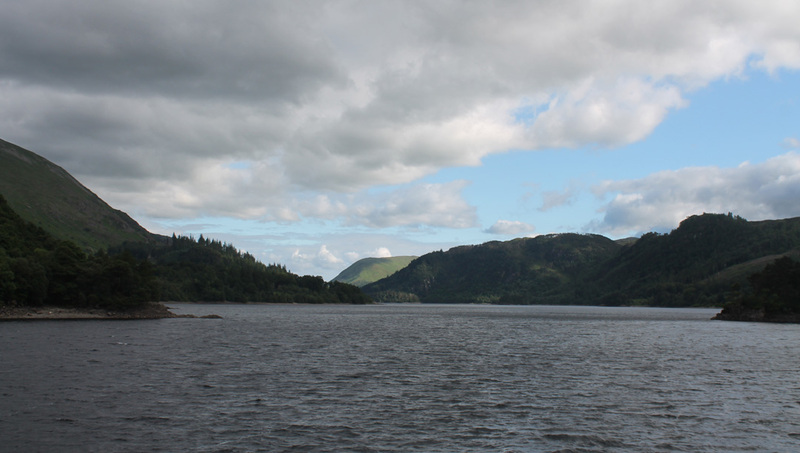 Weather : Perfect summer weather, warm sunshine with fluffy white clouds, very clear viz. Meg was our holiday guide to Emma Gorge, Kimberley, Australia, way back in pre-digital 1998. 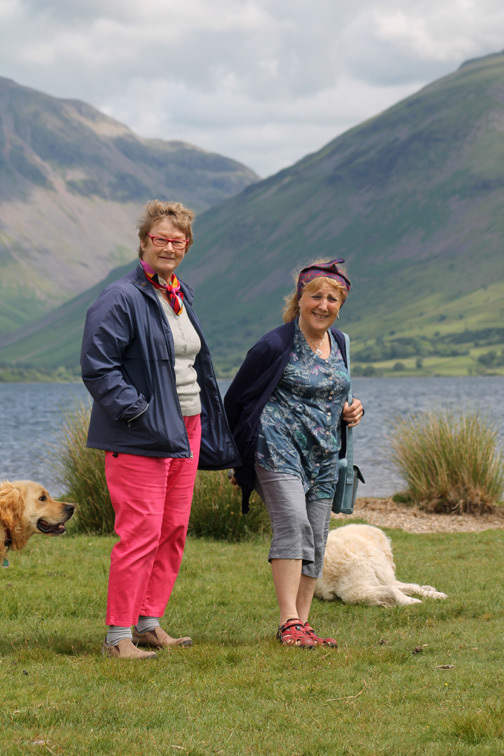 We've kept in touch and when she wanted to visit the Lake District it was a perfect chance to be her guide to our part of the world. 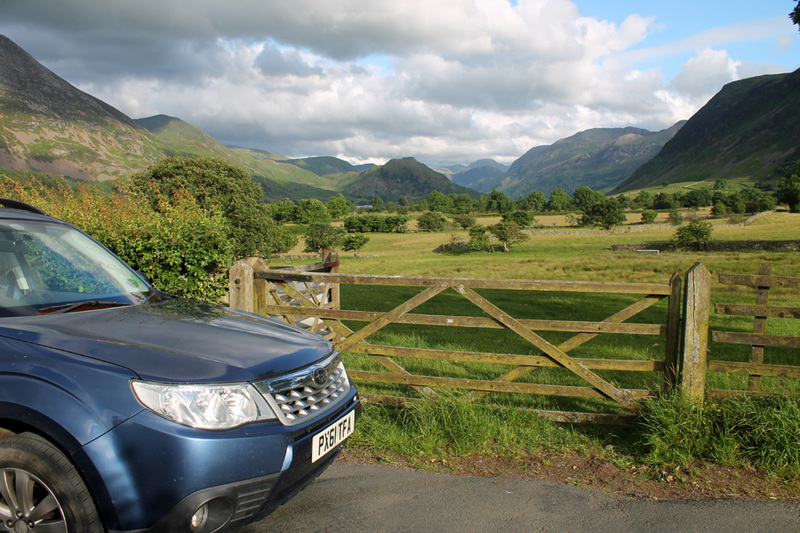 Today we fit all five of us and the two dogs in the one car for a drive around the area using the smaller back roads of the Lake District. the one spare bedroom in our cottage was already taken by Meg of course. 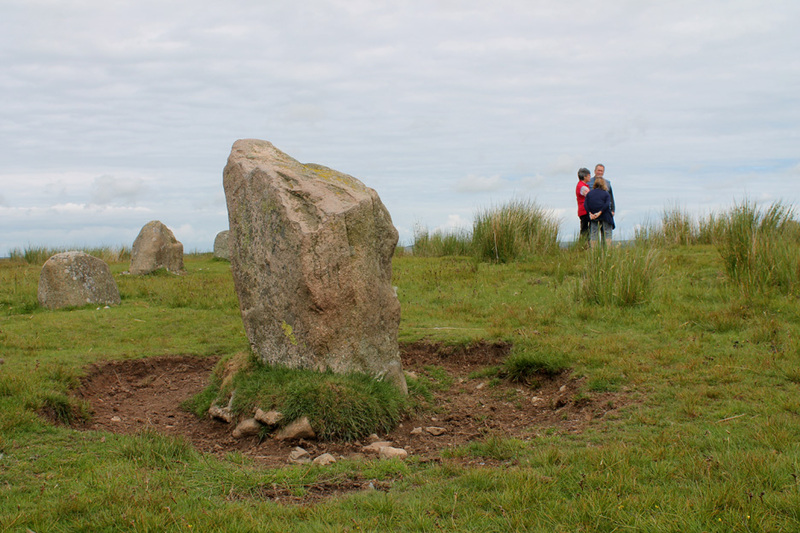 Our trip today was in an anti-clockwise direction around Cumbria . 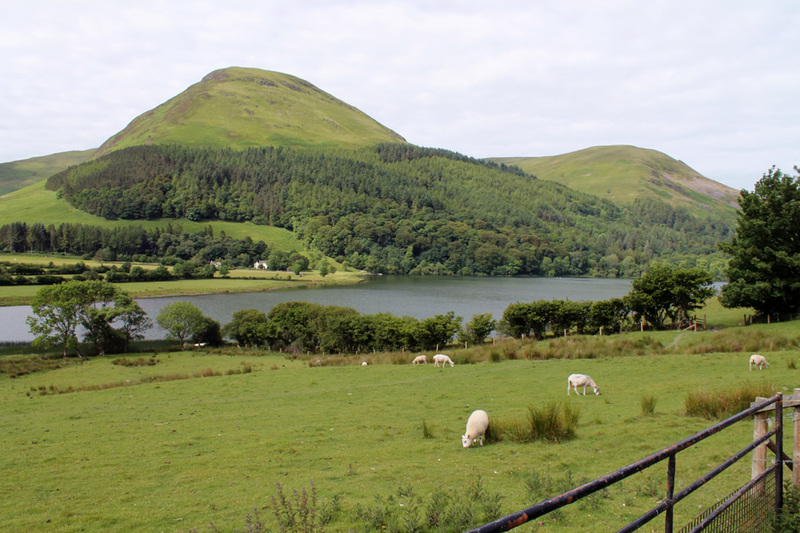 . . so we headed out alongside Loweswater itself. 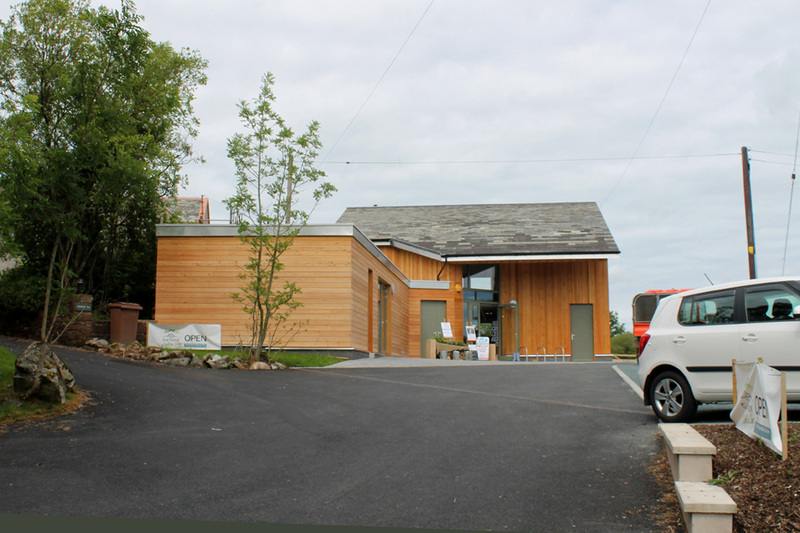 one is the heart shaped wood opposite the motorway near Tebay, the second is here in our valley. Hold your cursor over the picture to see the outline of the "Loweswater Pheasant" as mapped out in Holme Woods. 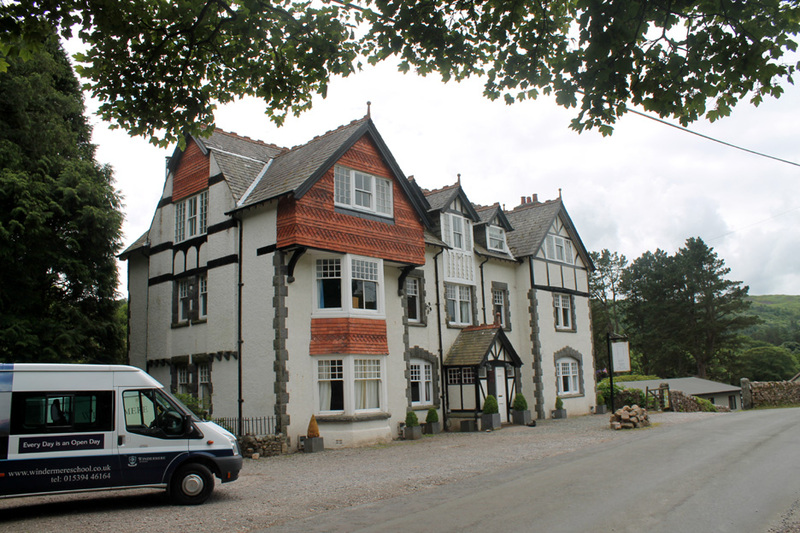 and is a great spot for your first night destination if doing the "Wainwright Coast to Coast" walk. 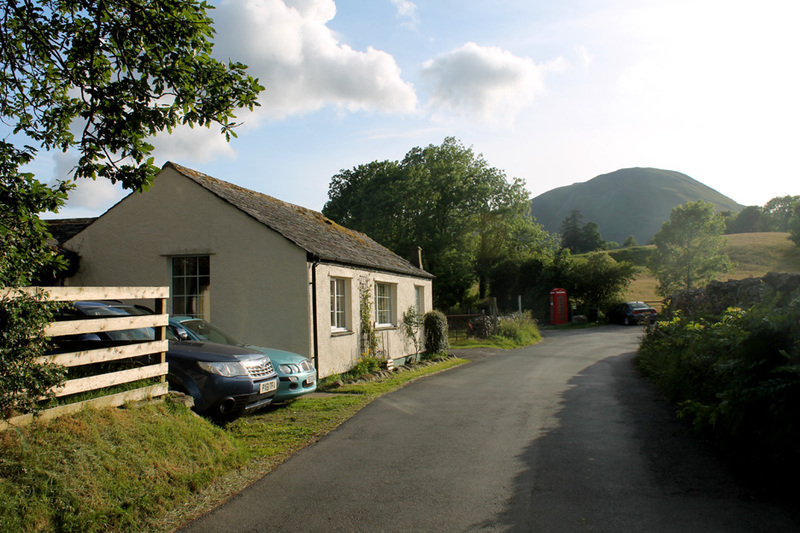 serves as a village meeting room and, as I understand, has a bunkhouse for overnight visitors and walkers. 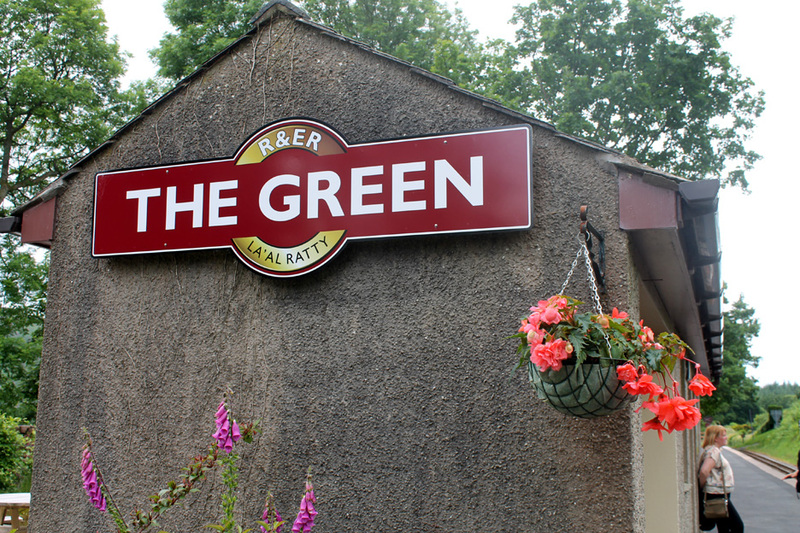 Both this and the pub are community owned and run village enterprises. Some say genuine, some say it's a Victorian folly, others maintain that it was merely repaired using the original historic stones. Whatever the history. 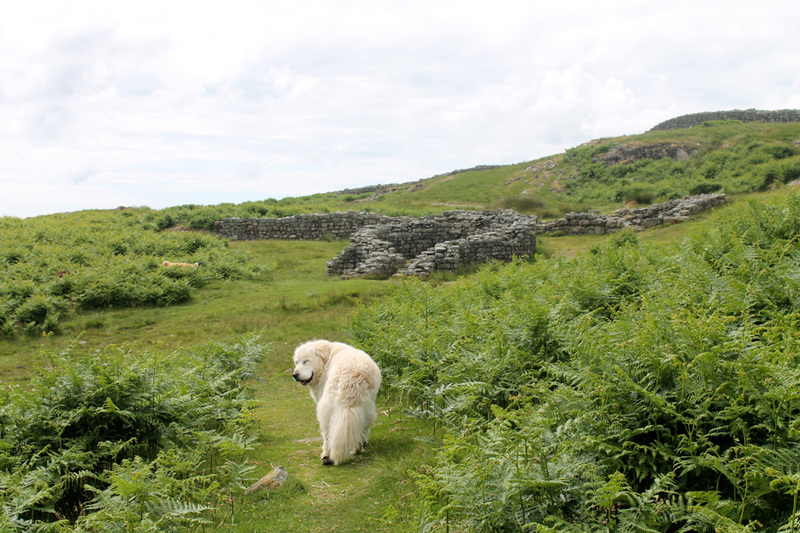 . . it is a nice place to stop and take in the surroundings. 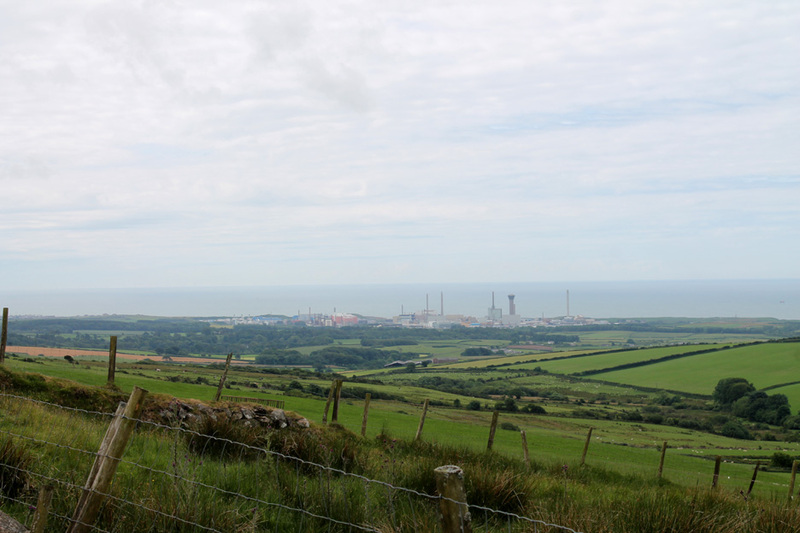 From the high point of Cold Fell road we look down on the nuclear reprocessing plant at Sellafield. Plans are in place to build a nuclear power plant alongside it to generate electricity for the grid in years to come. 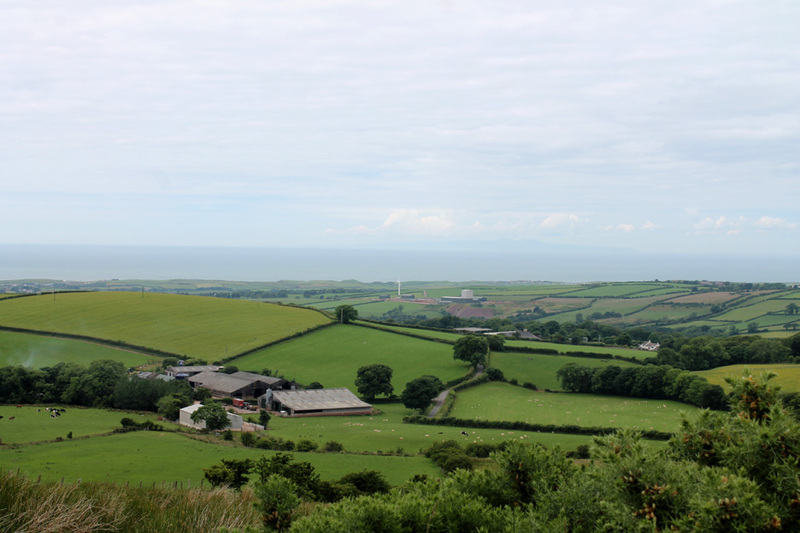 Out there beyond the distant sea haze is the Isle of Man. It can (just) be seen above the Sellafield Training Establishment . . . with the wind turbine and squat white tower. 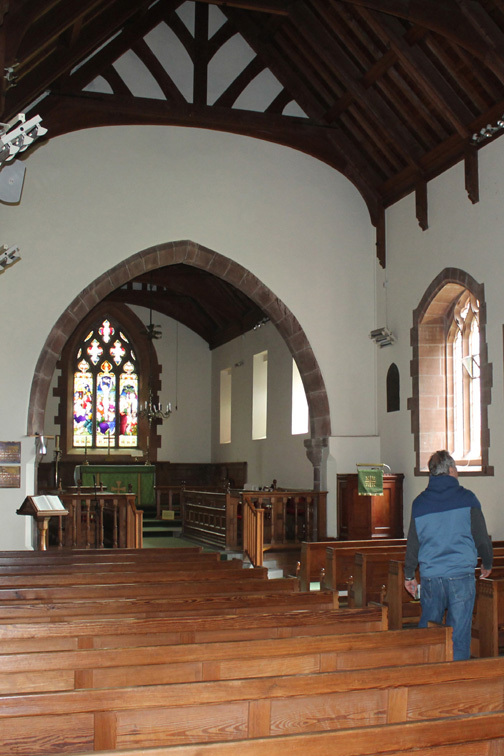 Next stop was St Mary's Church in the village of Gosforth. 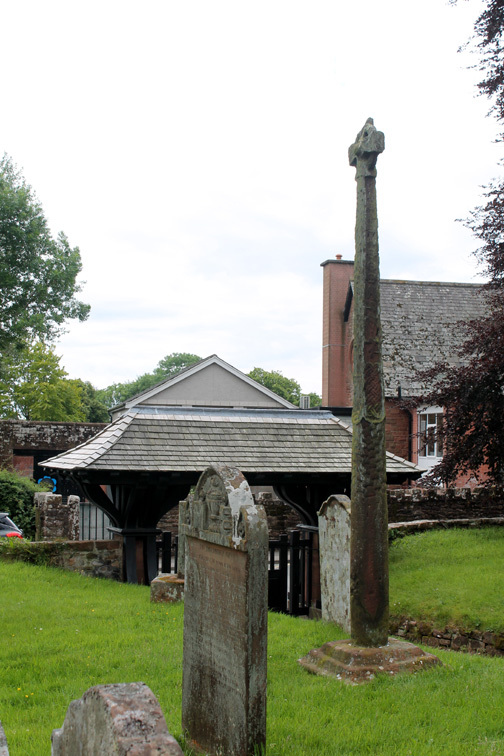 With the local school in session and plenty of cars parked along the road we entered this time by the lower, graveyard gate. 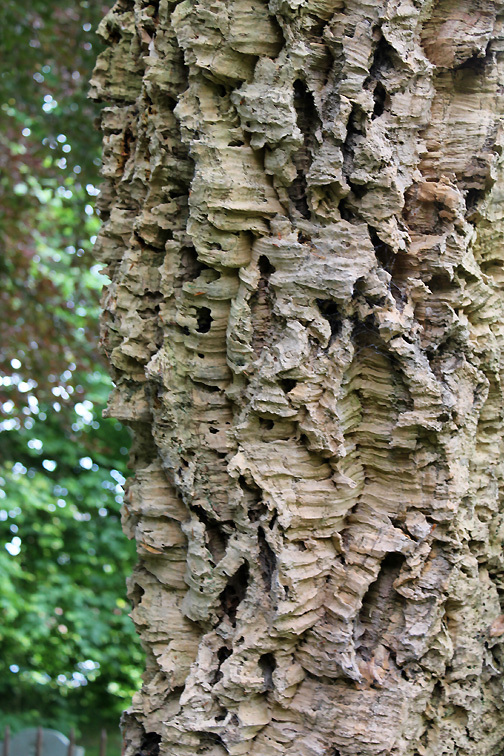 We were surprised and delighted to find . . .
. . . a genuine Cork Tree, apparently planted in 1833. 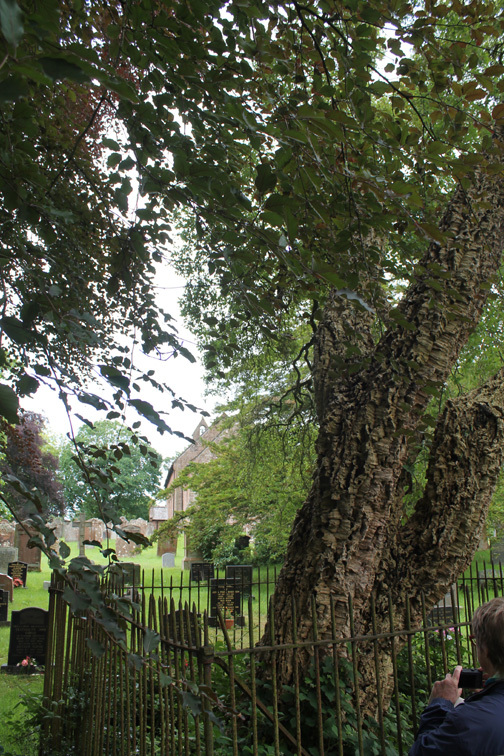 It claims the record for being the most northerly cork tree in Europe. 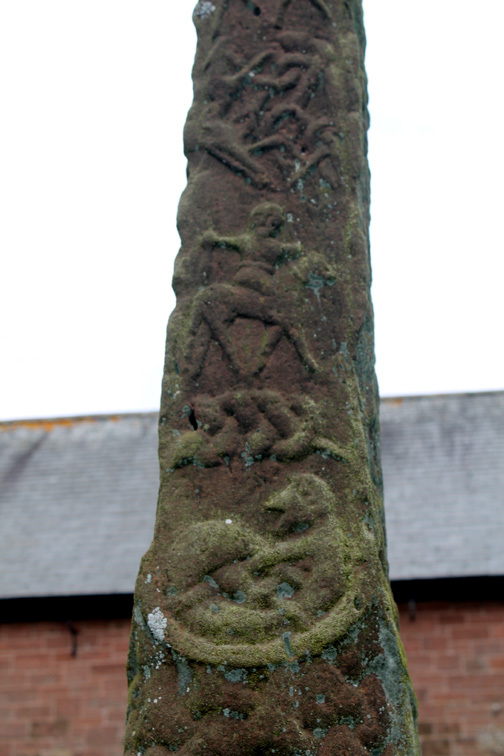 Some grave stones here date back over 200 years . . .
. . . but the Norse Cross we came to see is five times older ! 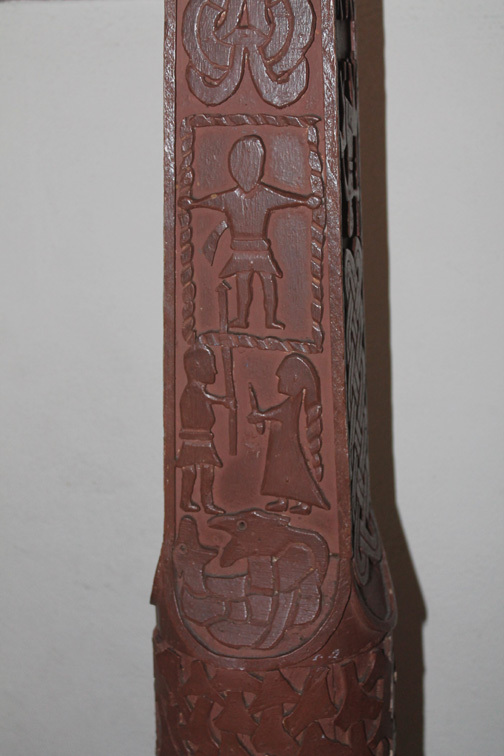 Well preserved carvings . . .
. . . and in the church a scale model replica of the structure. 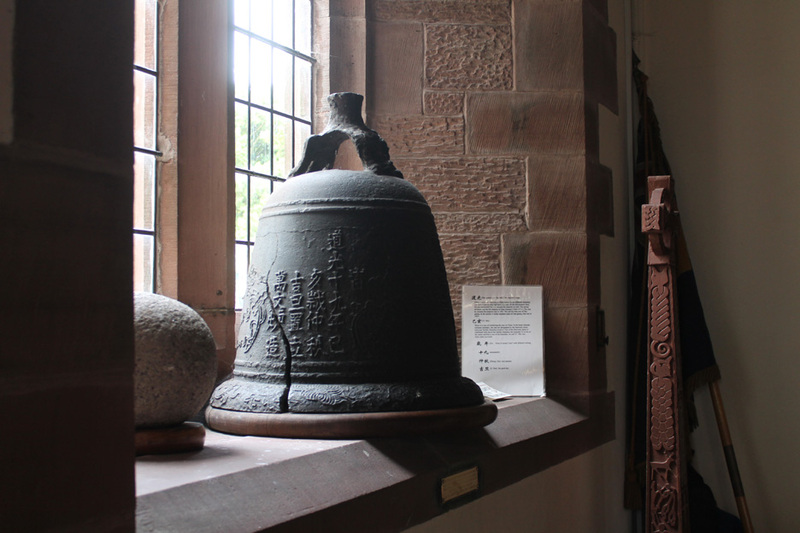 The church uses beautiful red sandstone in many parts of its construction. 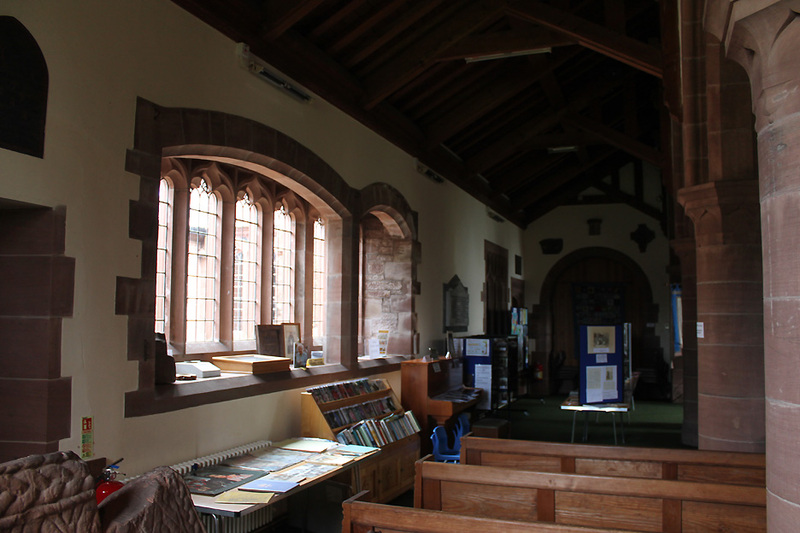 Jono commented on how warm, dry and natural the atmosphere in the church felt. The view of the east window in the main part of the church. 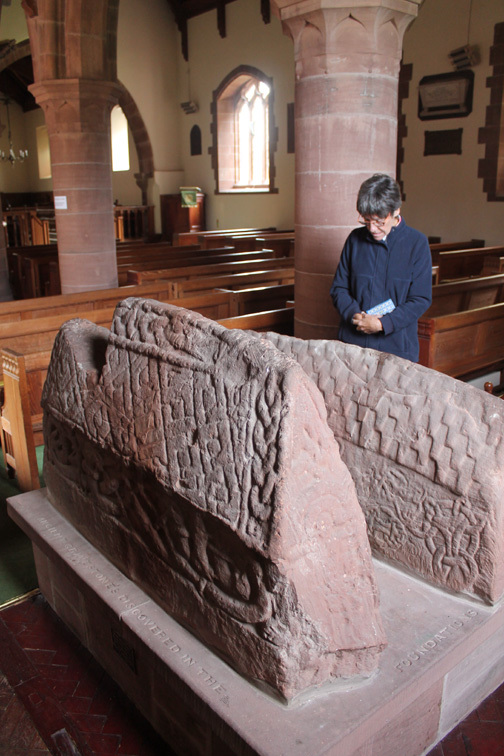 The Hogback warrior gravestones are believed to represent Nordic houses and have battle scenes amongst their carvings. 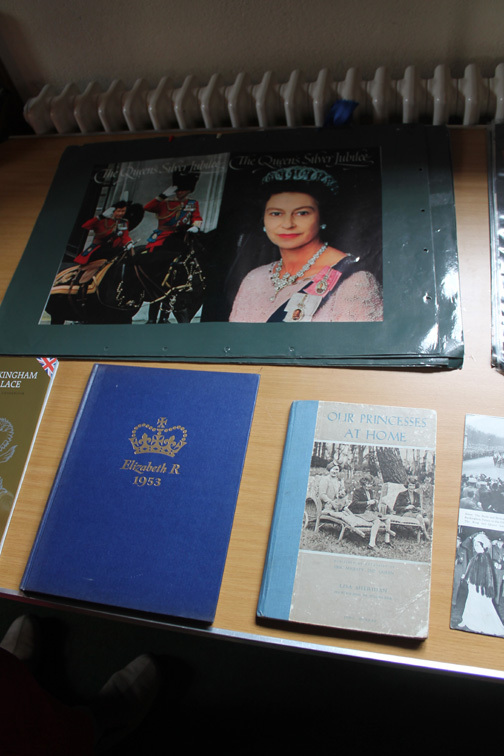 There was a display to celebrate the Queen's 90th birthday. 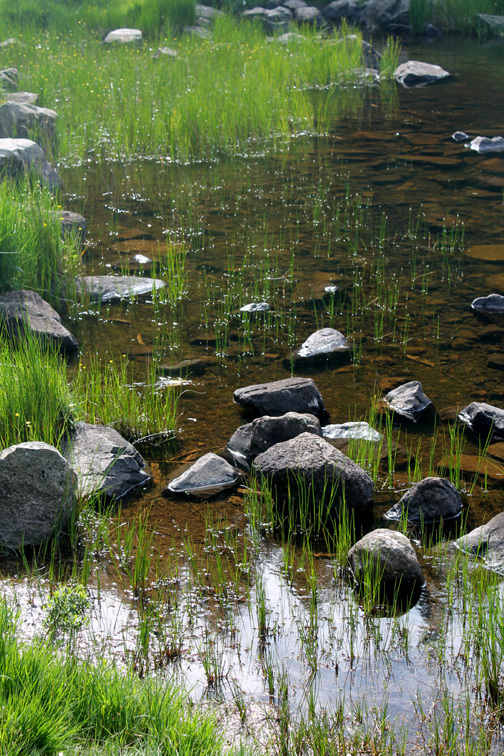 "The Fishing Stone" in one of the alcoves. 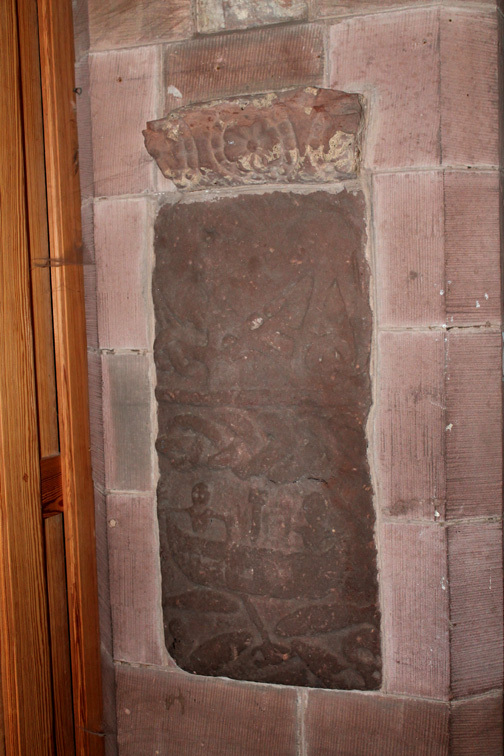 There were many ancient carved stones incorporated into the 1896 rebuilding of this ancient church. 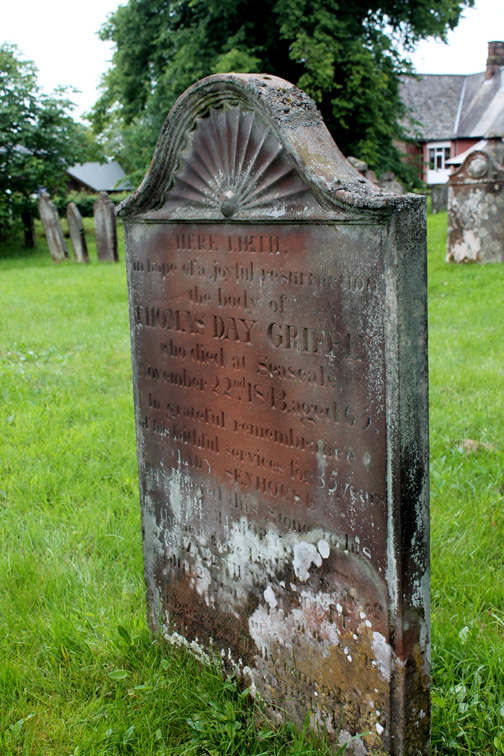 and was donated to the church in 1844. Sorry no details of when it became cracked ! 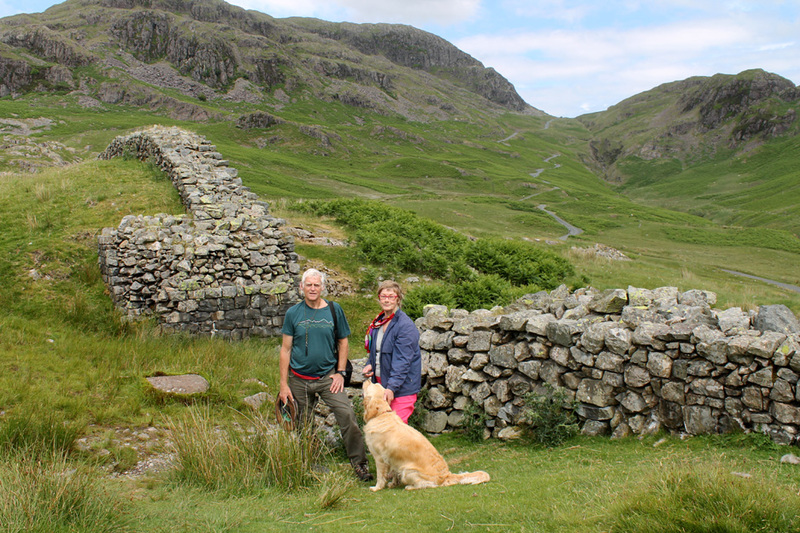 Time to head out and see the head of the Wasdale valley. 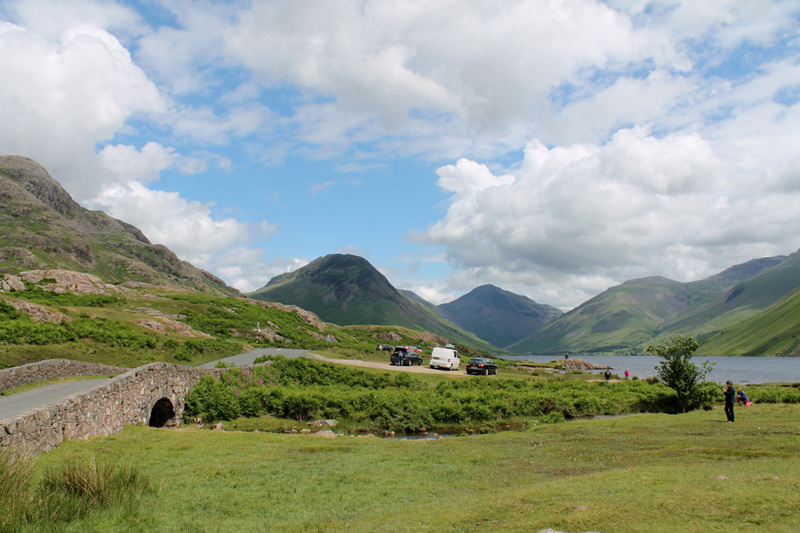 The weather is excellent today as we park up at the junction alongside Wast Water. Deep in the Lakeland fells . 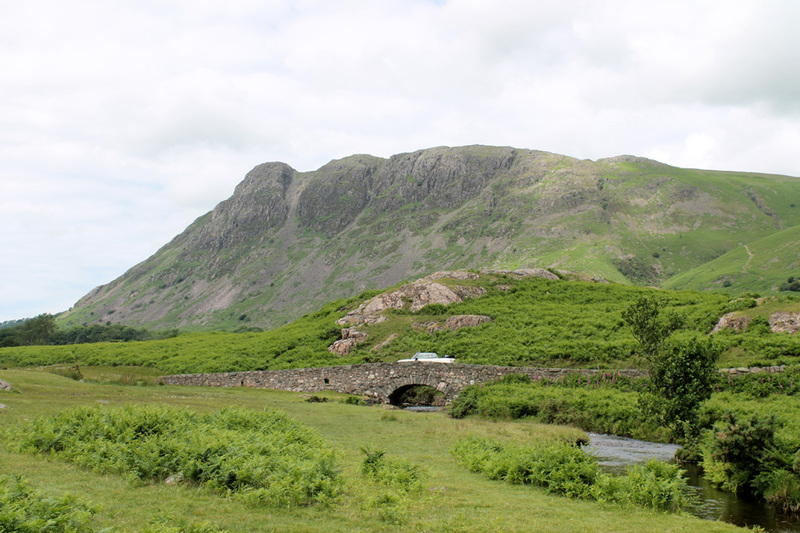 . . this is Buckbarrow. 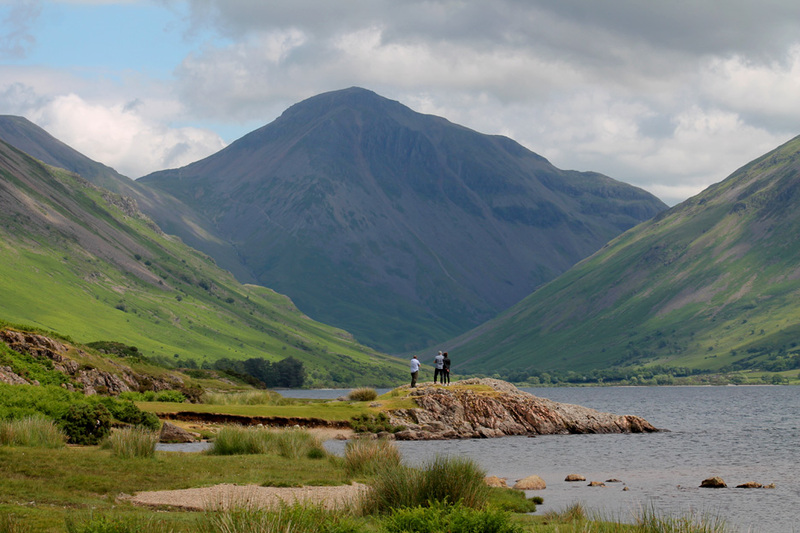 Yewbarrow commands attention towards the head of the valley. They raise their eyes to the hills . 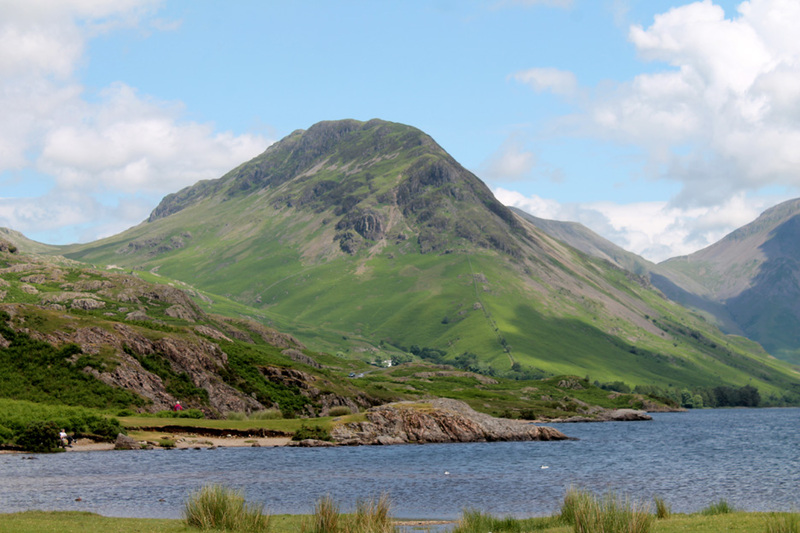 . . Great Gable in particular. Dylan and Harry . . . two gentlemen also. Looking across the water . . .
. . . one red sail, then another, caught the eye. 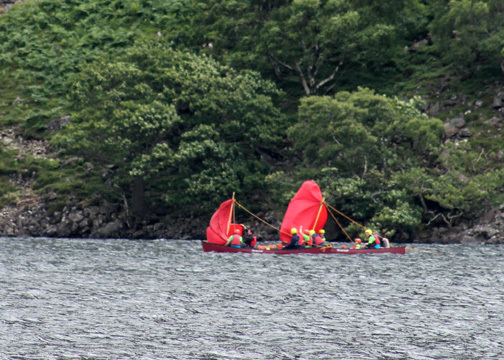 In close up you can spot the outdoor pursuits boats which have raised simple sails to carry the group effortlessly up the lake. Meg takes in the scene . 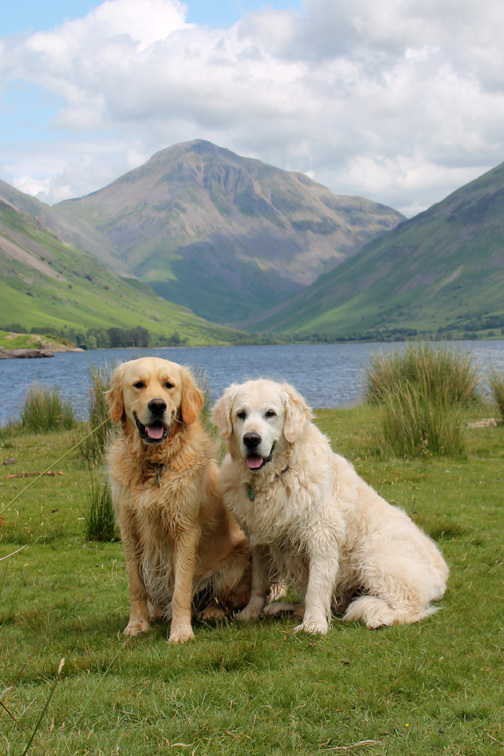 . . a classic view of Cumbria National Park. 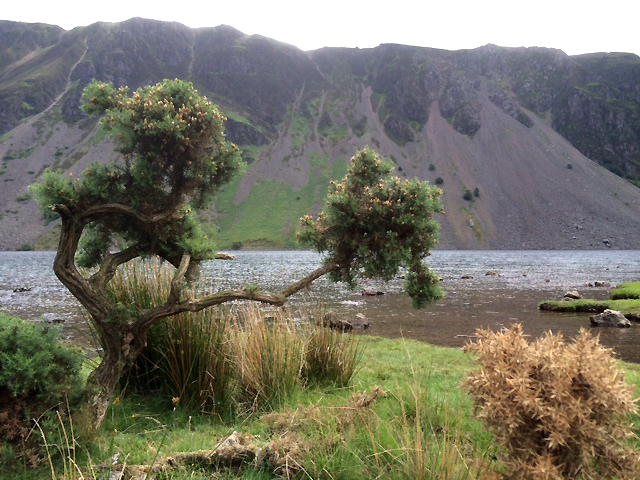 Helen also sent me this photo of the Screes and a picturesque gorse bush on this side of the lake. T'is the season now for cotton grass growing on the damp moorland soils. 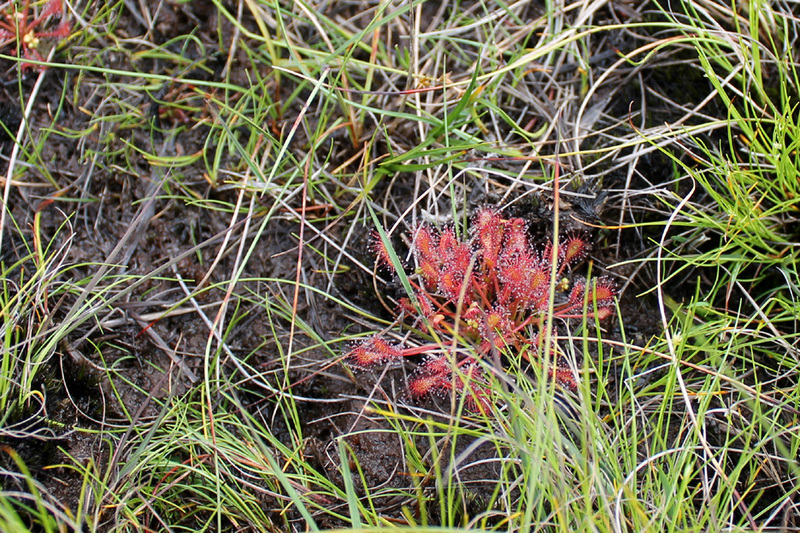 A special find, a sundew plant . . . with many more when we looked around. Large . 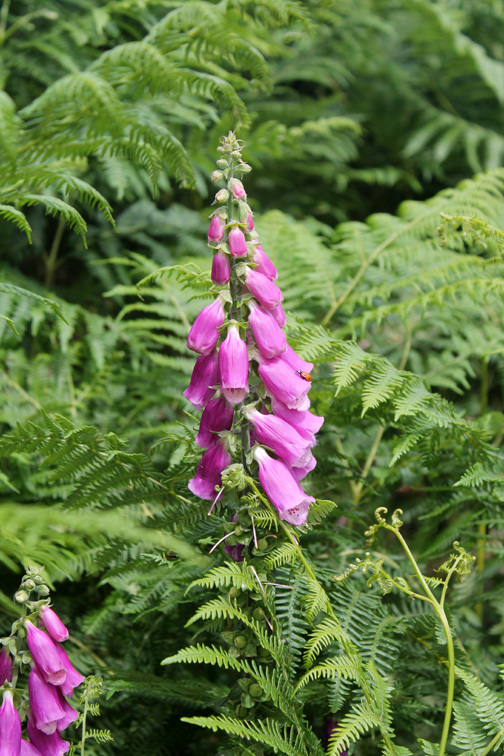 . . a foxglove grows through the bracken. Small . 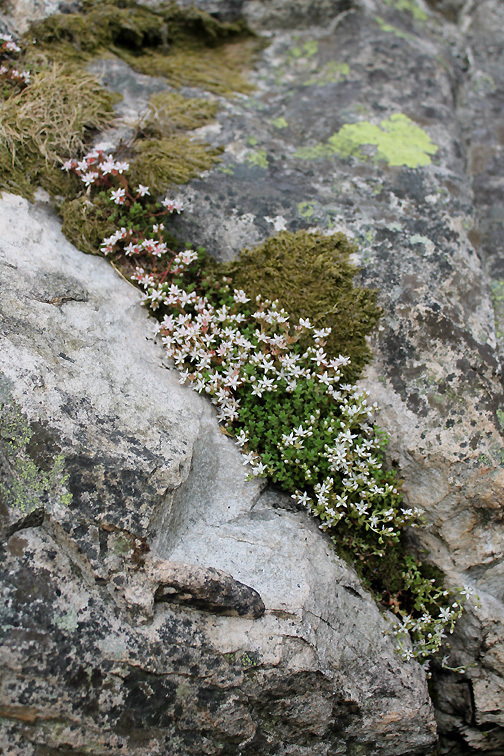 . . English Stonecrop growing in a rock crevice. 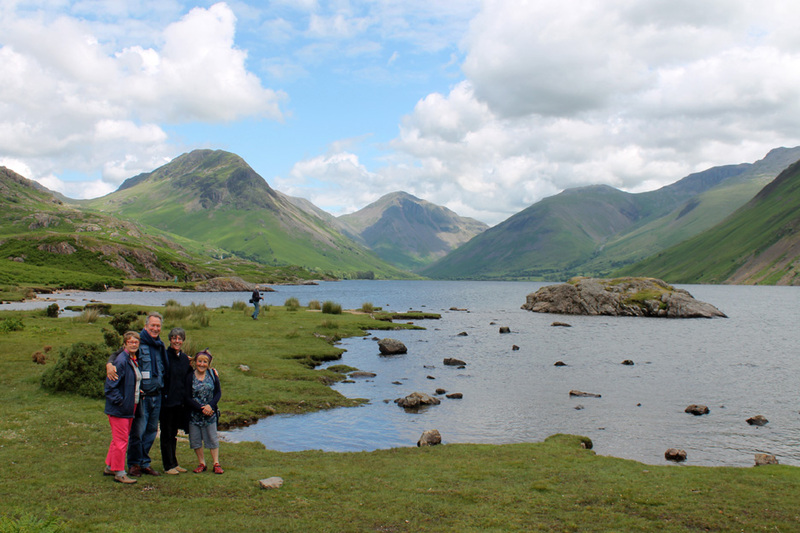 Our group at the side of Wast Water. 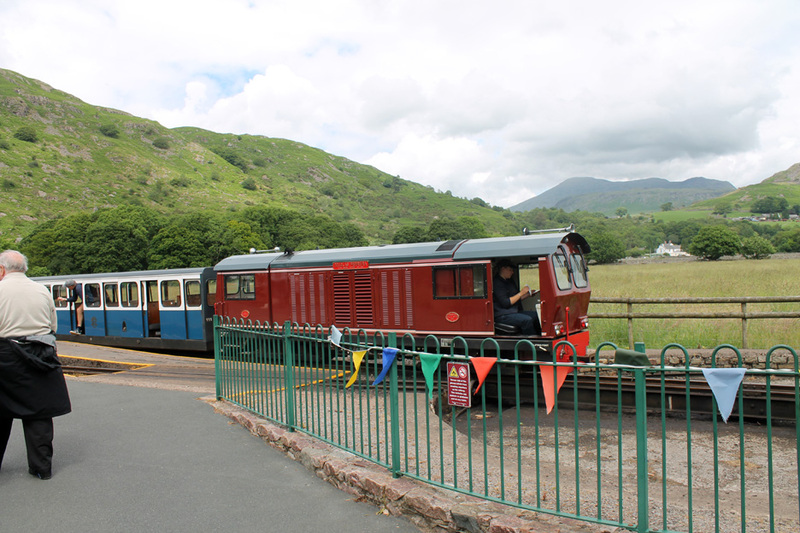 We just missed a train to Dalegarth so continued on by car. Stanley House - Beckfoot . . . where we caught up with the train. This one is diesel hauled today . 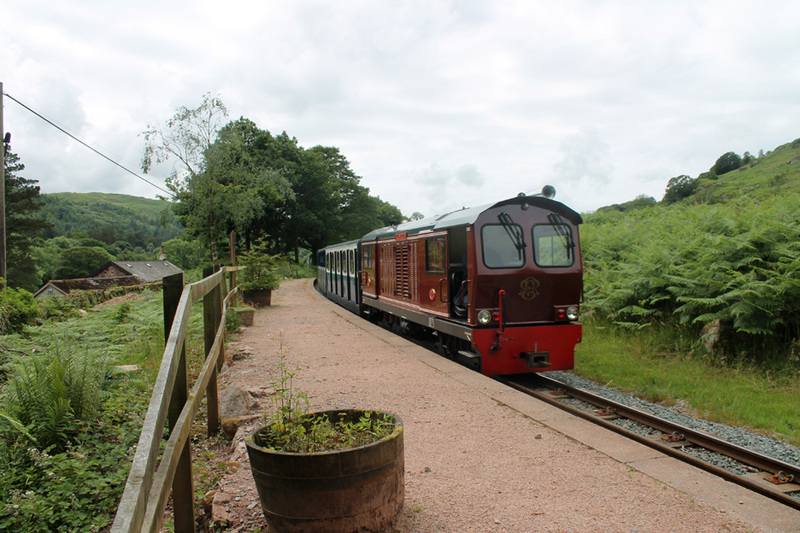 . . seen as it passed through Beckfoot station. 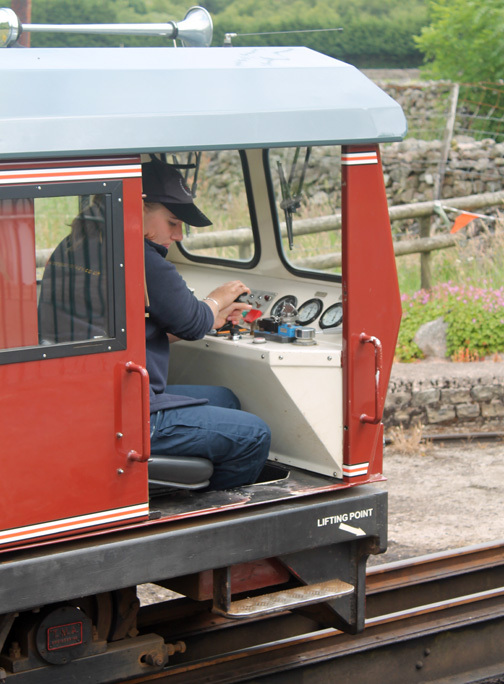 At Dalegarth terminus the engine advanced onto the turntable. 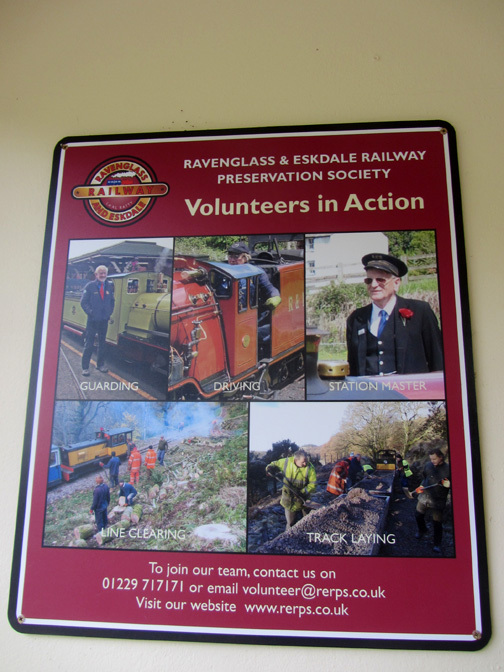 The check-plate ensures the rails stay aligned. 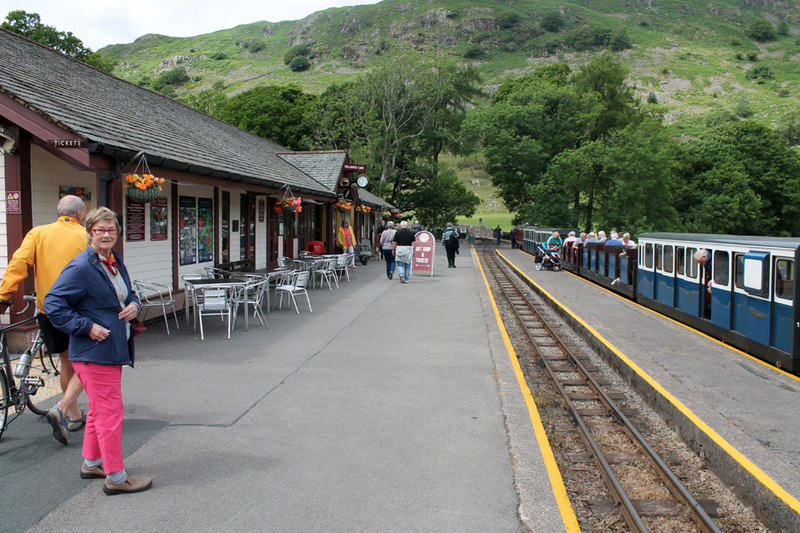 With the train ready for the return trip we have the chance to visit the station buildings. 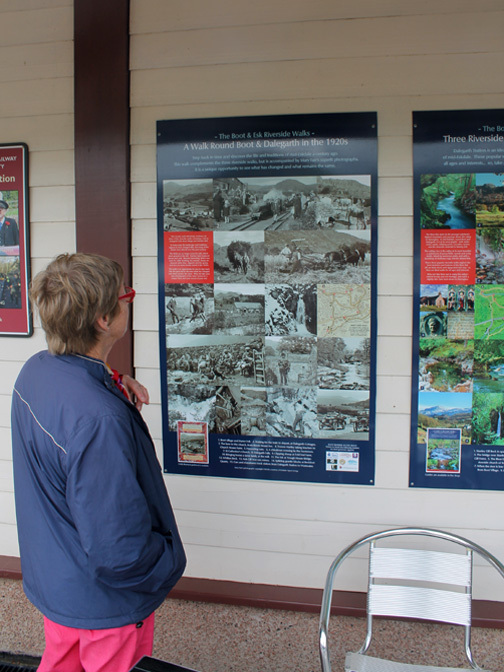 Meg studies the old valley photos on the poster . . .
. . . and examples of the huge effort of their volunteer crew. Half way through the day . 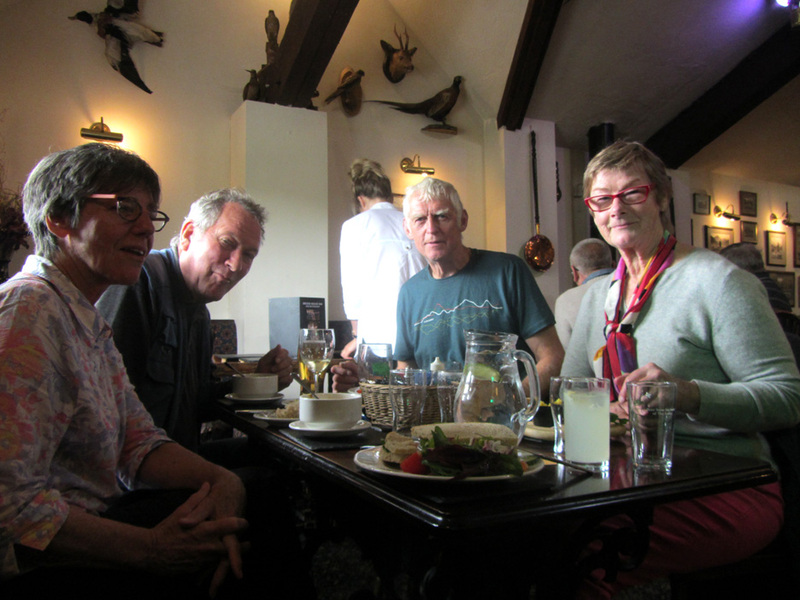 . . so we visit the Brook House in Boot for a rather nice lunch. 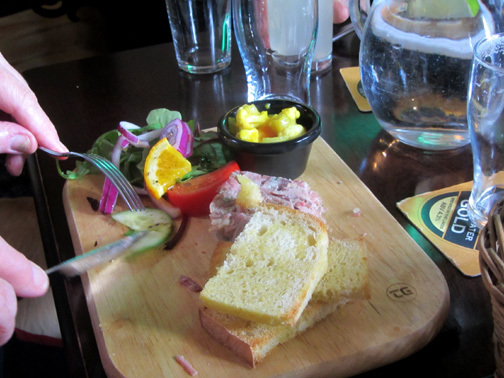 Meat platter for one . . .
. . . 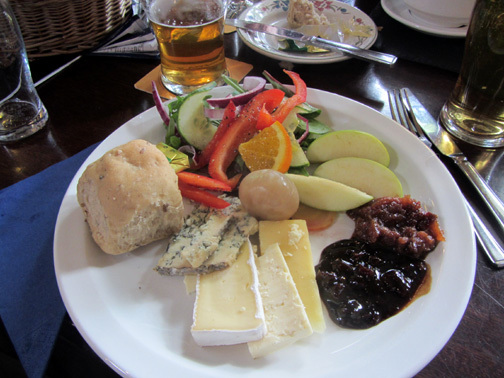 Cheese Ploughman's for another. 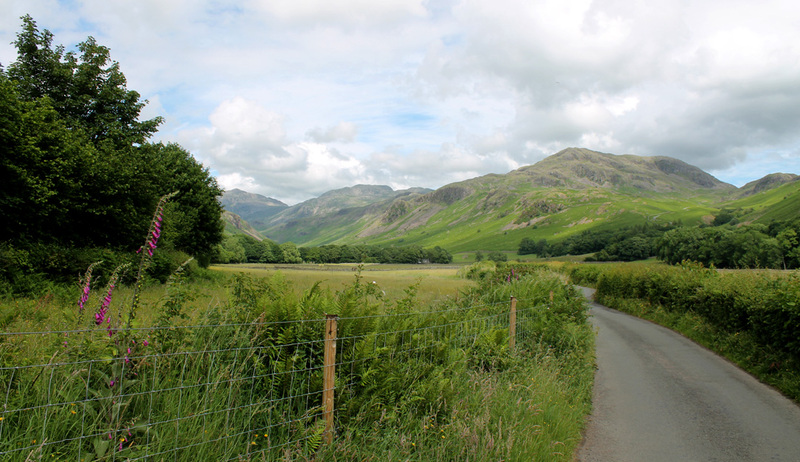 The road leads on up the Eskdale Valley towards Hardknott Pass. 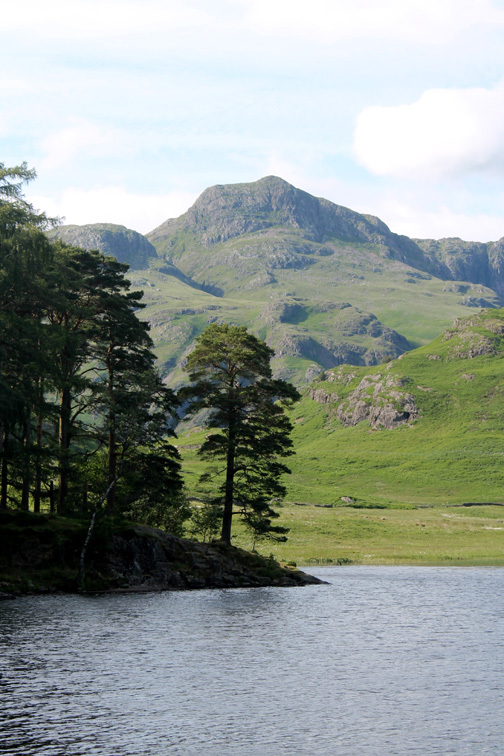 Distant fells are Bowfell and Crinkle Crags. 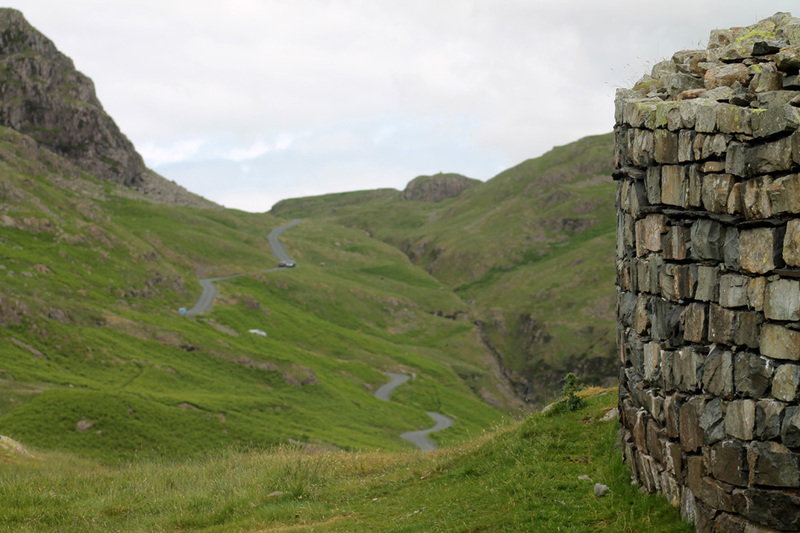 Hardknott fell is the one ahead as we look up the road. 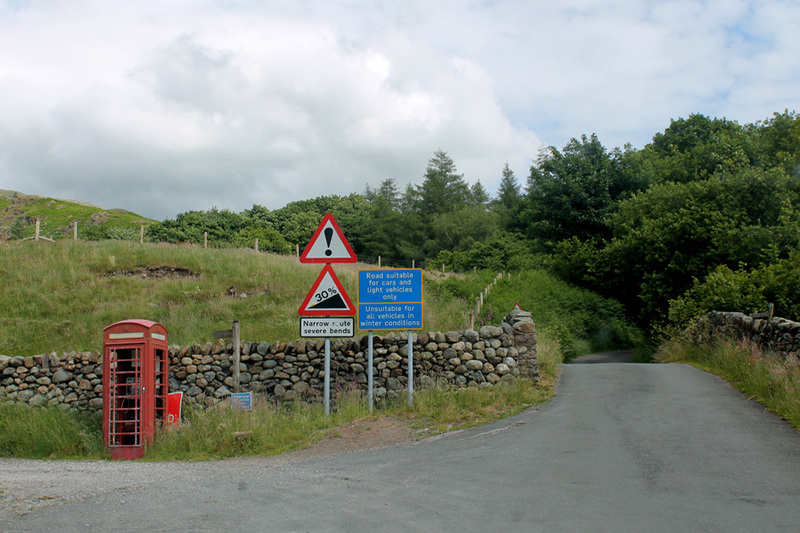 The red phone box at the foot of the pass is in a sorry state. The road signs give obvious warnings of the severity of the road ahead. 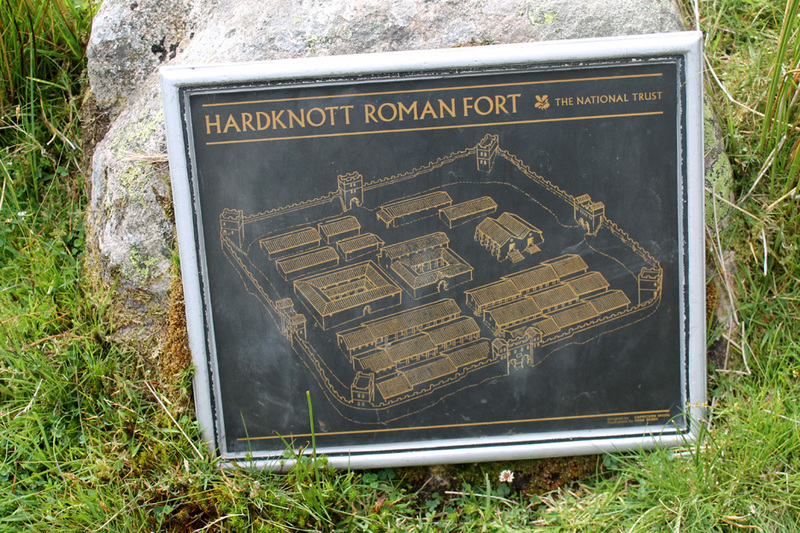 Hardknott Pass is the location of a classic old Roman fort, Mediobogdvm, which we'll visit today. Head down - bottoms up . . . as they read the notice about the fort. Harry leads the way . . . he's been here before . . . and knows the way even with his eyes closed. Ann contemplates the foundations of the old Roman bath house. Meg and I by the south eastern entrance gate of the main fort. The fort is built on classic Roman lines . 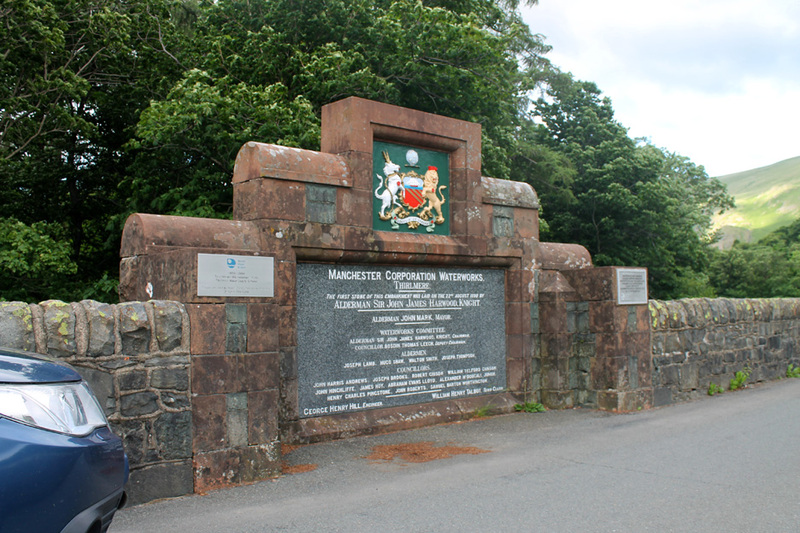 . . rectangular with curved, turreted corners and four entrance gates. The central part of the fort with the foundation stones of the main buildings. 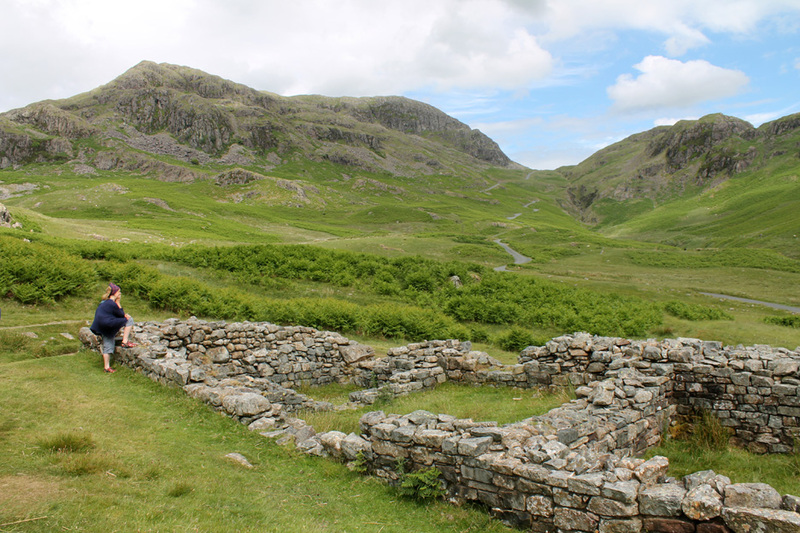 The fort commands a fine view down the Eskdale Valley from the western corner turret. Out to sea, the Isle of Man again . . . though it looks like a bank of cloud in the distance. 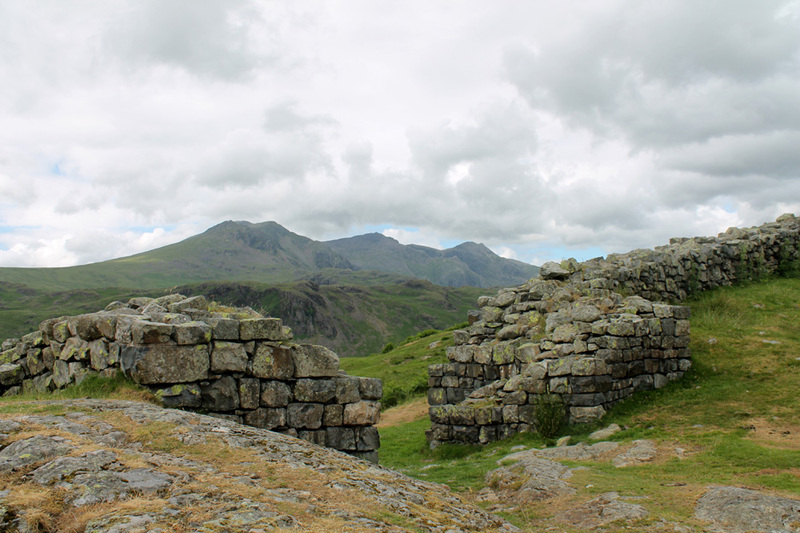 The north western gateway and the classic view of Slight Side, Scafell, Scafell Pike and Ill Crag. 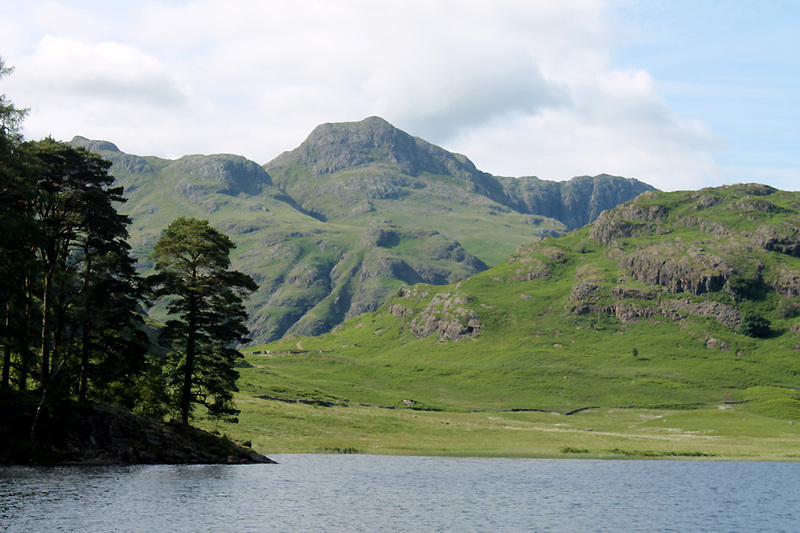 and we can now make out Broad Crag behind and the lower pointed summit of Pen in front of Ill Crag. 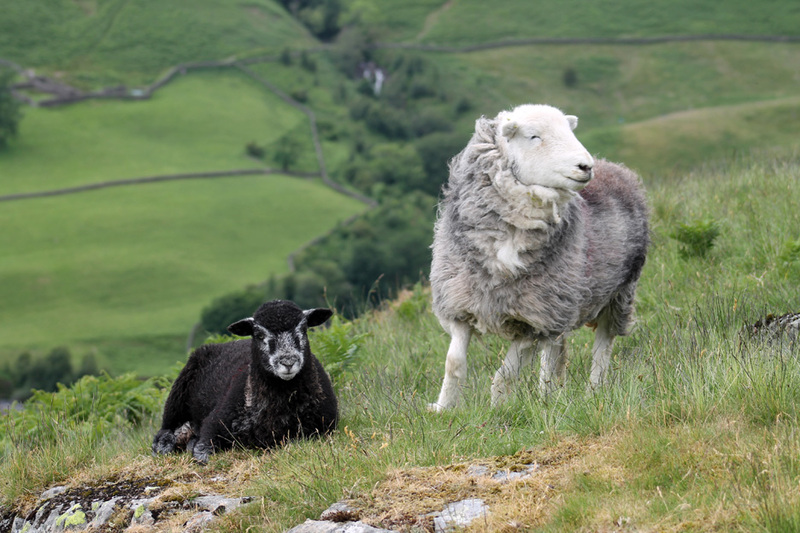 A first year Herdwick lamb and its mum. At this stage the youngster has a black coat and delightful white sunglasses ! That's our route ahead . 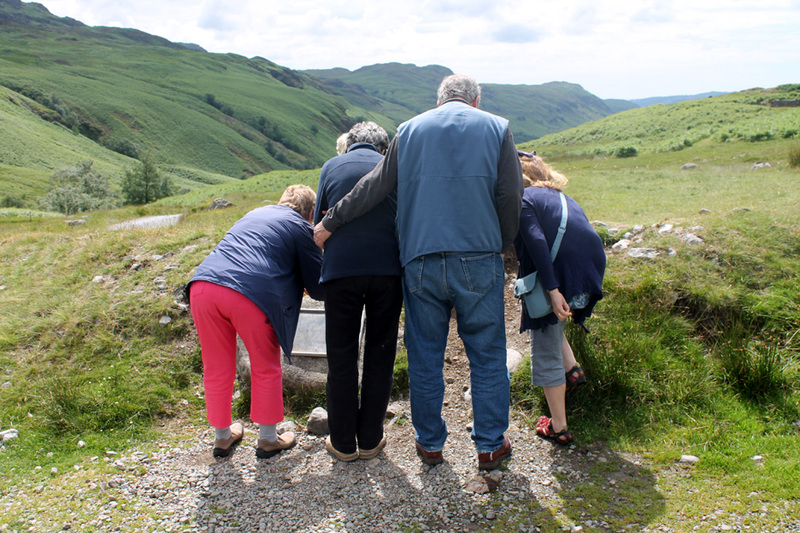 . . time to focus our thoughts on the remaining part of our journey round the Lakes. The camera had other ideas and focused on the impressive Roman walls to the right. From the top of the pass . . . after driving up the 1:3 gradients on the hairpin bends . . .
We park just over the brow and walk back up to the summit. The first road ascent is behind us . 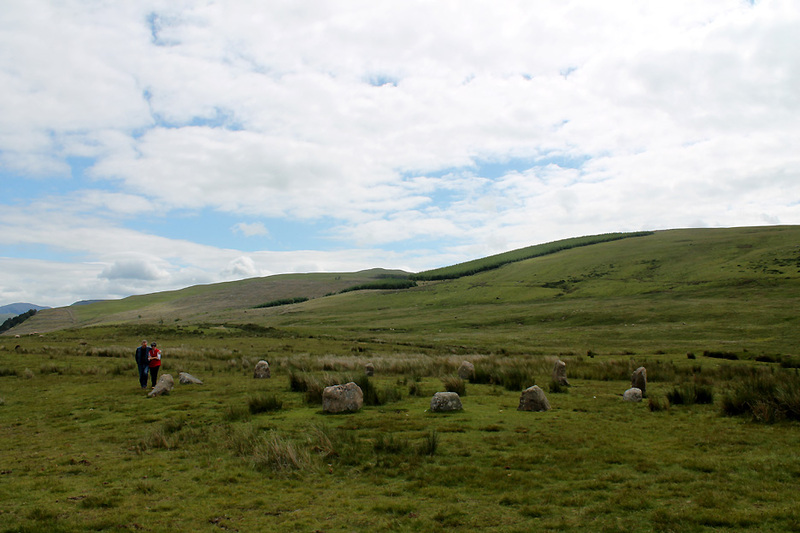 . . ahead is the Wrynose Valley and the second mountain pass we need to cross. From the top of Wrynose Pass we are able to look down into the sunshine of Little Langdale. The road winds down to the 17th century Fell Foot Farm. The flat area of grass between the trailers and the farm is the location of an ancient meeting place . . . the Ting Mound. 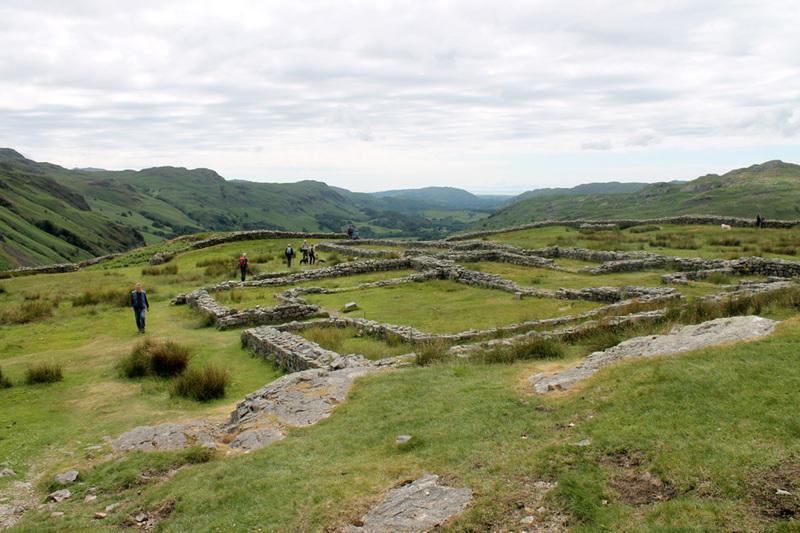 Here the early open-air parliament of Cumbria met in Viking times. 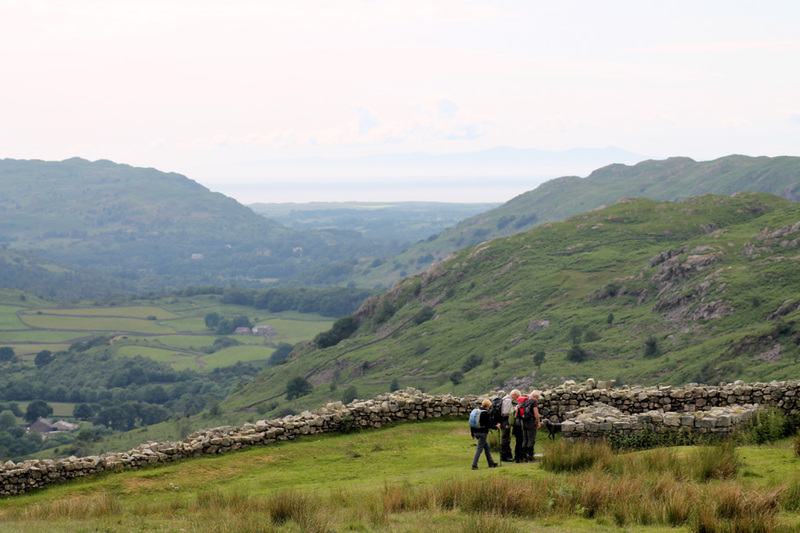 including the Roman road from Ravenglass to Ambleside and later the packhorse routes through the valleys and passes of the area. 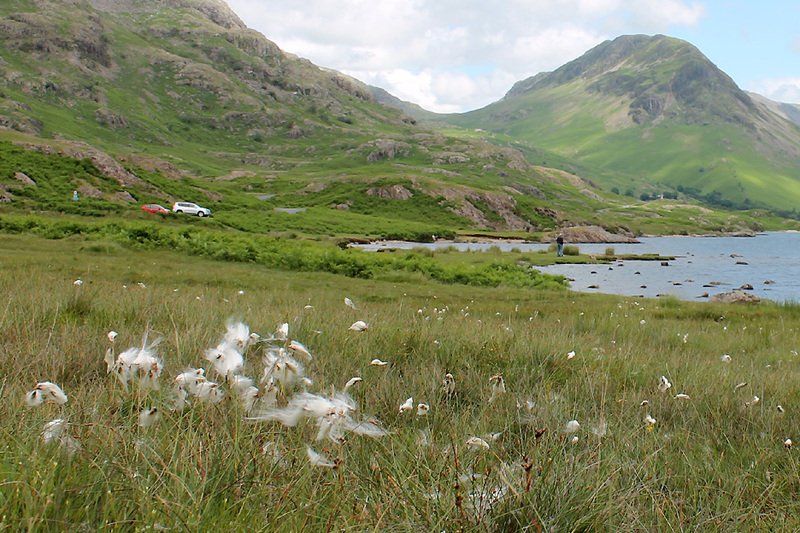 We turn north and head across to Blea Tarn . 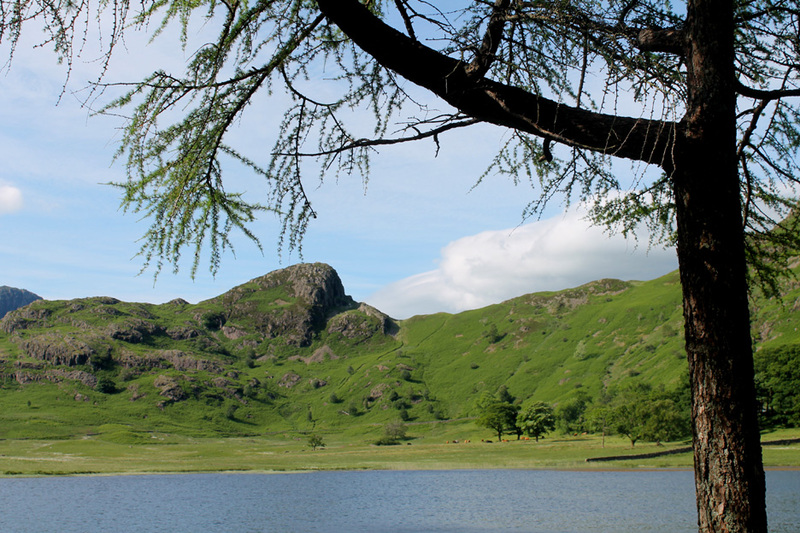 . . another classic tarn (or small lake) of Cumbria. 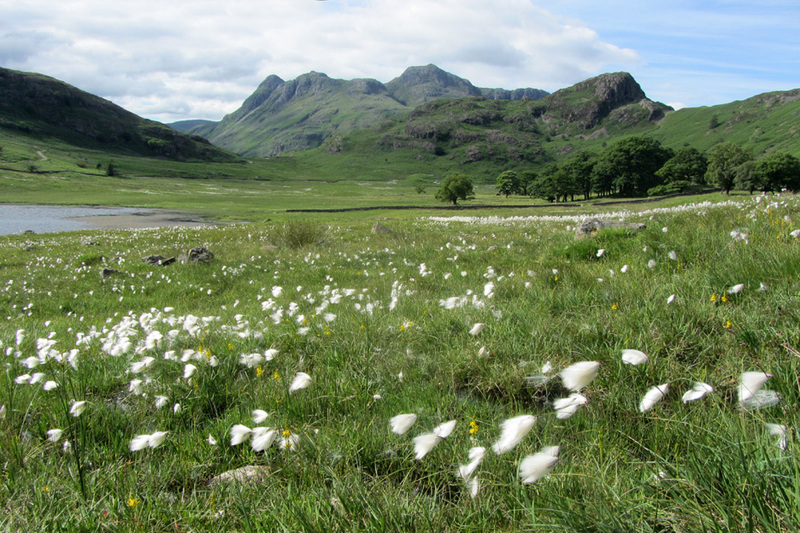 More cotton grass on the moist ground as we look across to the famous outline of the Langdale Pikes. A honey spot in high summer but thankfully quieter today. 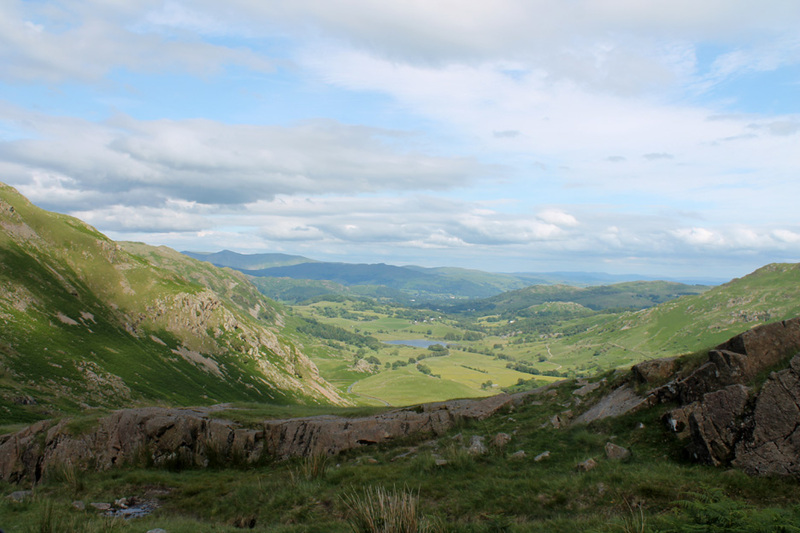 Pike O'Stickle, Loft Crag, Harrison Stickle and Pavey Ark are in the valley beyond. One of the most photographed trees in the Lakes . . .
. . . but there is beauty in even the smaller detail. 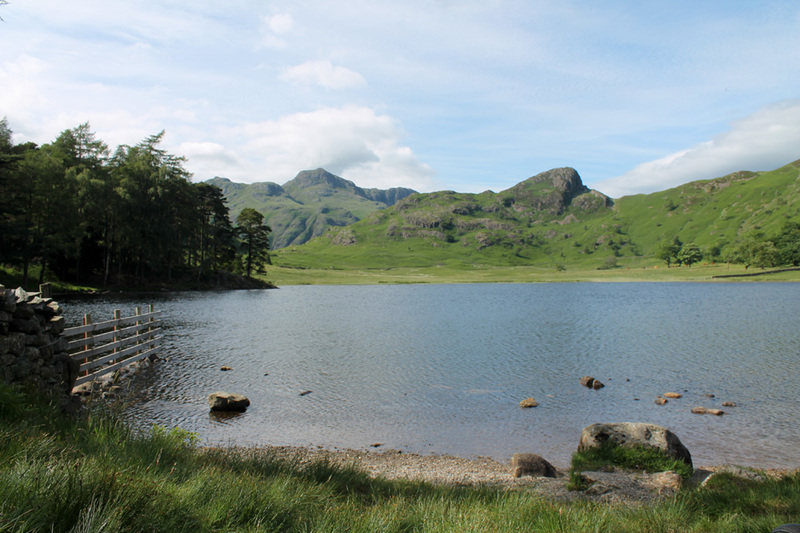 Side Pike across Blea Tarn . . . our route takes us around the far side of the lake. 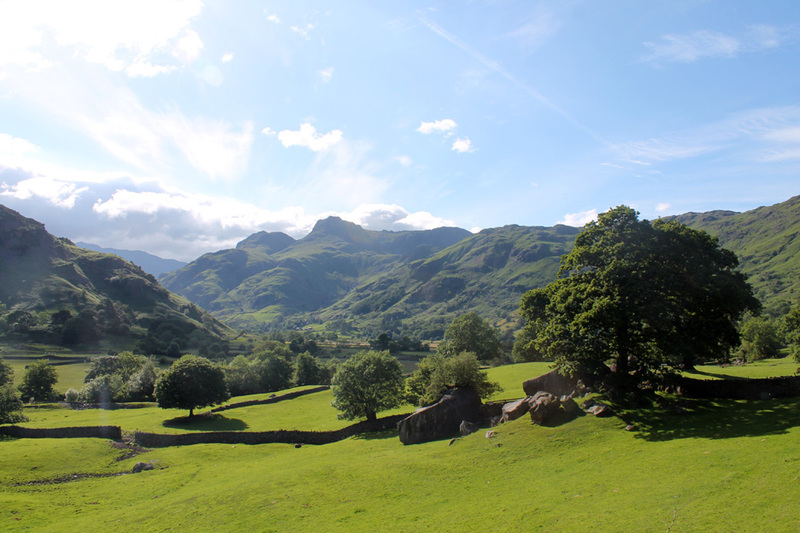 Just beyond the cattle grid the view opens out as we drop down into Great Langdale. Ahead of us the twin valleys of Oxendale and Mickleden, split by The Band, the rising spur of land in between. Another fine view deserves another stop . 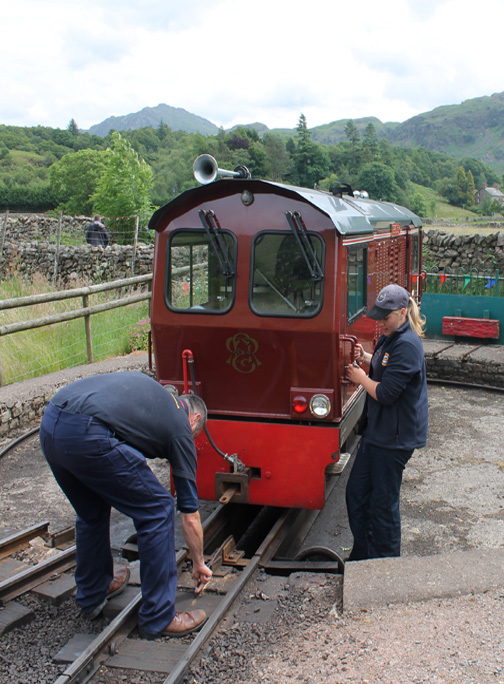 . . as Meg lines up for a photo of the Langdales. There have been so many interesting pictures to take that batteries are running out on several cameras and phones. Time to be heading home . . . but there's still plenty to see along the way. 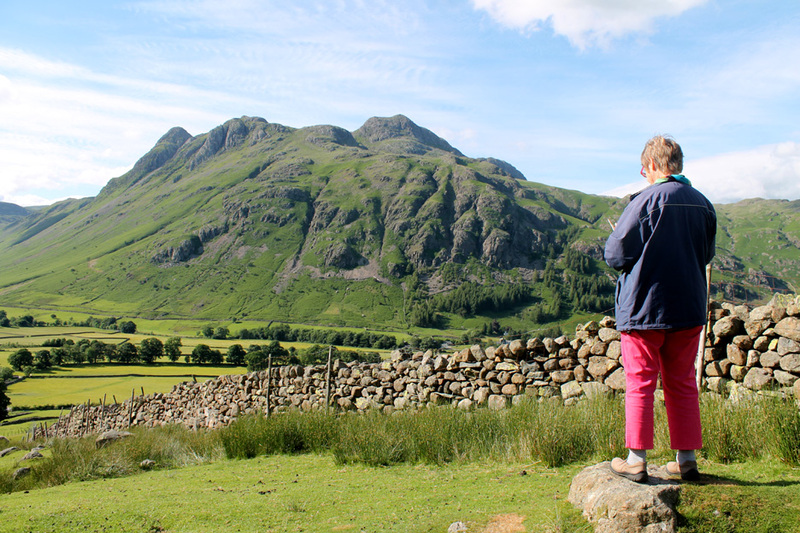 The boulders in Great Langdale that have ancient 'cup and ring' marks. 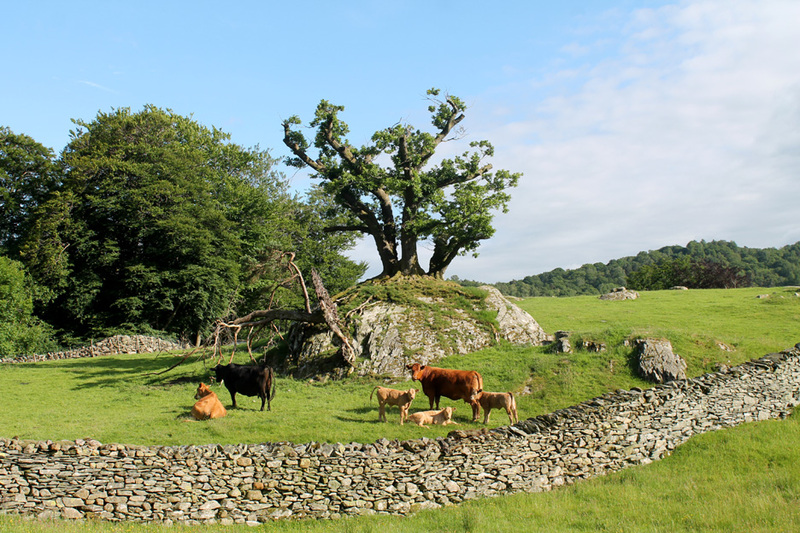 The oversized 'Bonsai' oak at Chapel Stile . . . the tree seems to be growing out of the rock. The old and the new . 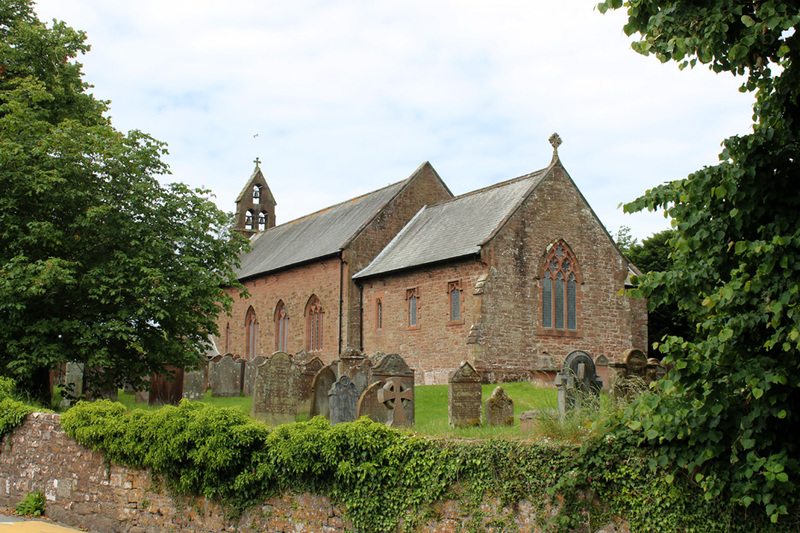 . . buildings in Chapel Stile village. Over Red Bank and now Grasmere is laid out before us. and Seat Sandal with Helm Crag on the left. 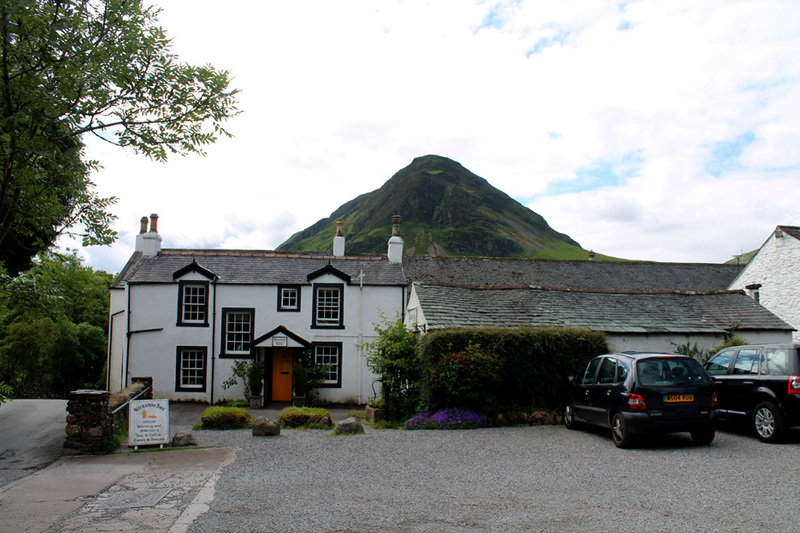 This final peak is on the western side of the road as it crosses over Dunmail Rise. 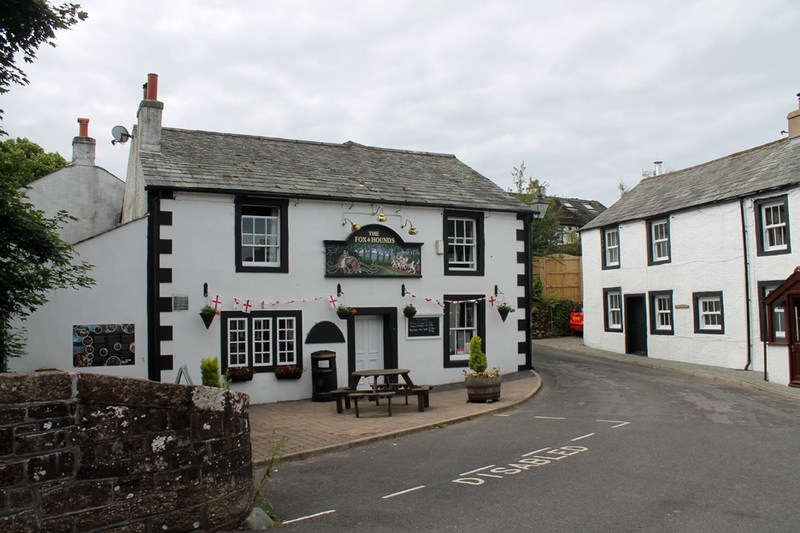 This area was home to the famous poet and author William Wordsworth and his family. 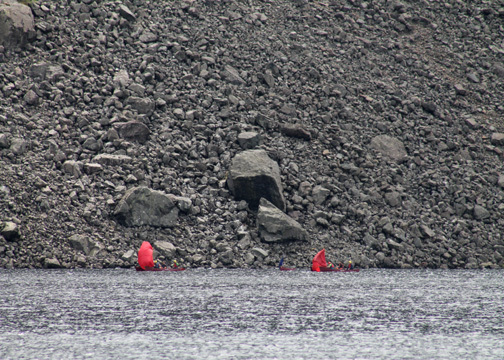 Two of his homes are encompassed by this photo . . . Dove Cottage (in the trees to the right) and Allan Bank up on the field to the left. 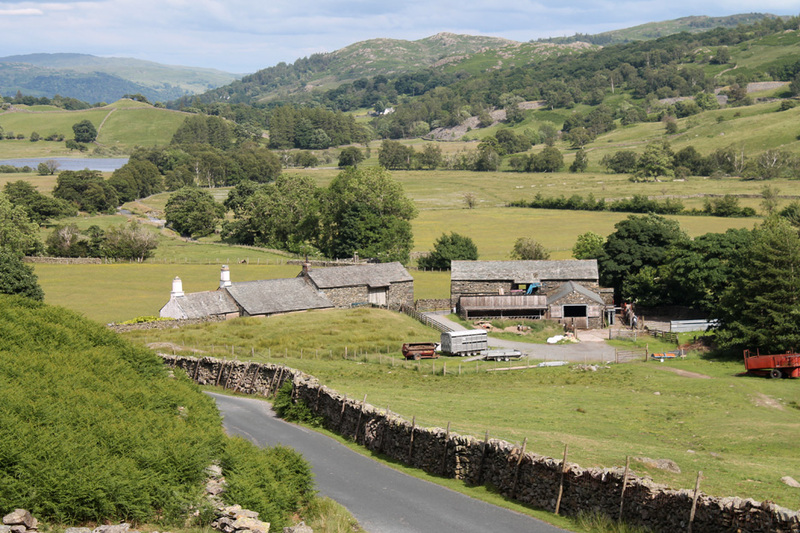 His third and major home, Rydal Mount, is a just few miles closer to Ambleside (to the right in the wider picture above). After a long delay due to the winter flood repairs . 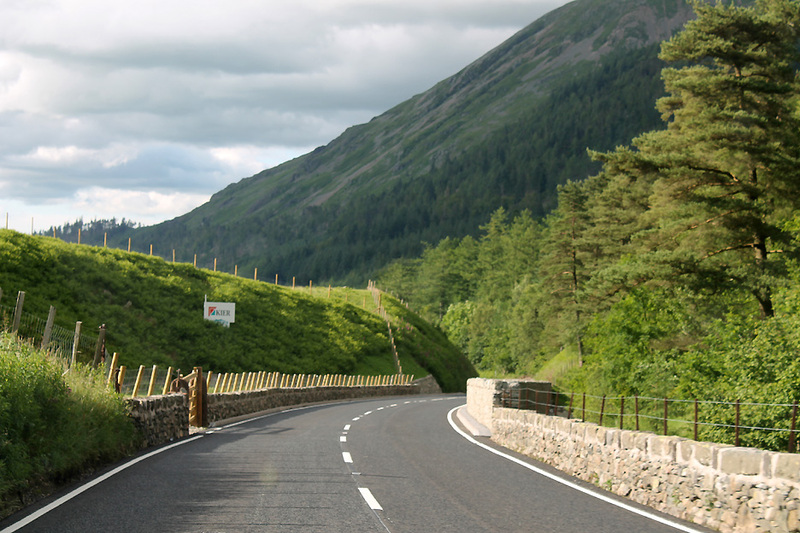 . . the road to Keswick is open once more. 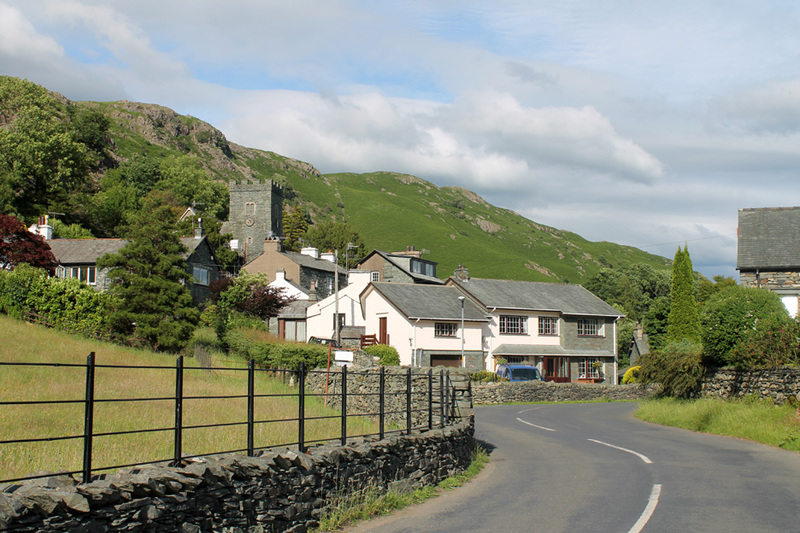 In preference to the main A591 road we take the minor road on the other side of the lake. From here we get a more distant look at all the gravel washed down from the fells and more repaired areas of the main road. 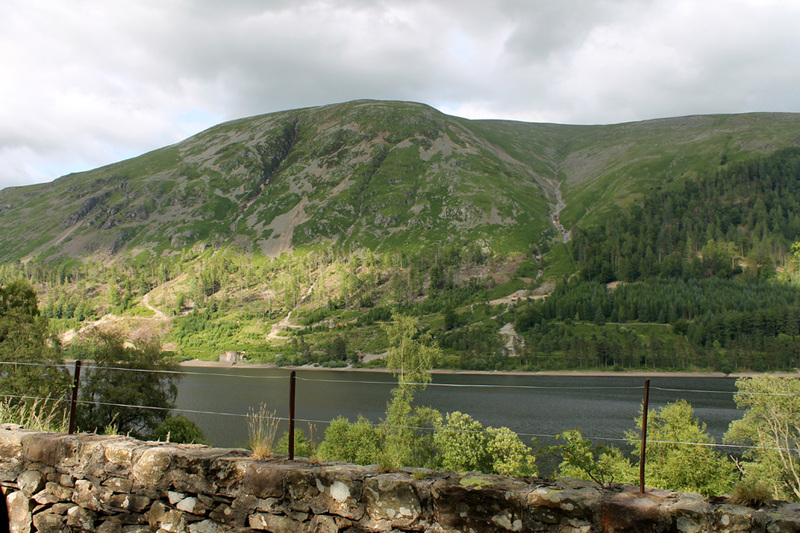 We stop on the reservoir road across the dam to read the plaques to commemorate its building . . .
. . . and to look at the view all the way back up Thirlmere to Steel Fell away in the distance. 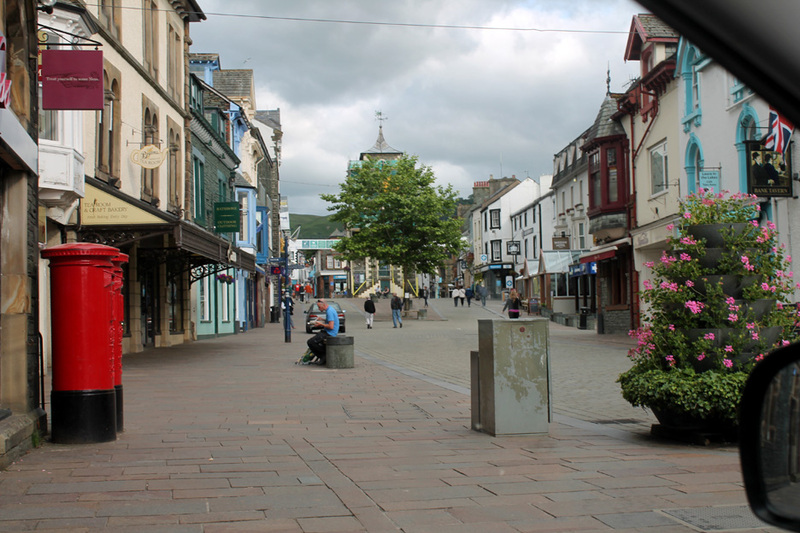 Nearly six o'clock and Keswick is quieter now the shops are shut for the day. 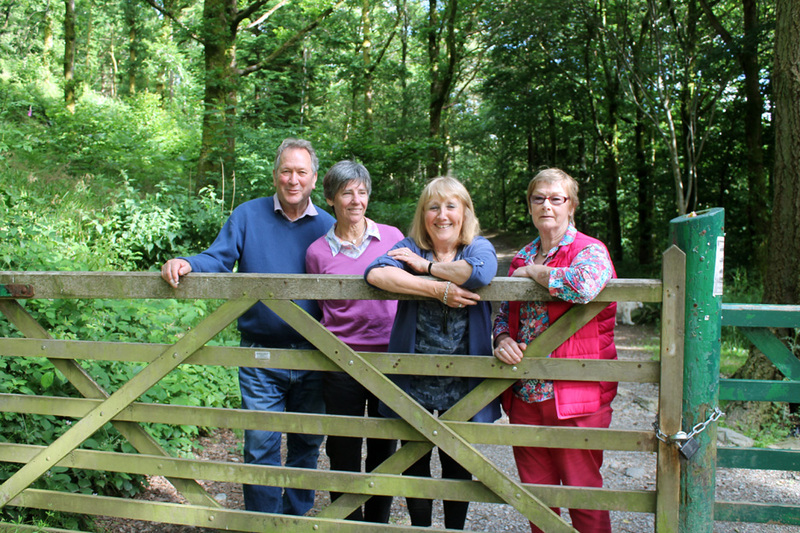 Yesterday Meg, Helen and Jono visited Wordsworth House in Cockermouth on their way to Loweswater. Today we can therefore take in one more new mountain pass they haven't travelled . . . that of Whinlatter. This is the view of Bassenthwaite Lake and Skiddaw from the Knoble Knott viewpoint. Closing in on home as we pass the new shop in Lorton. 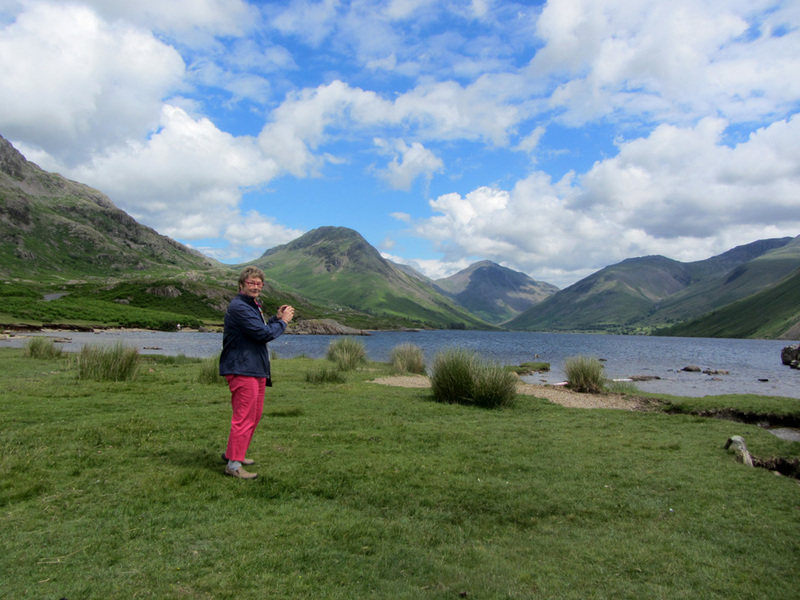 One last stop for a view up the Buttermere Valley. 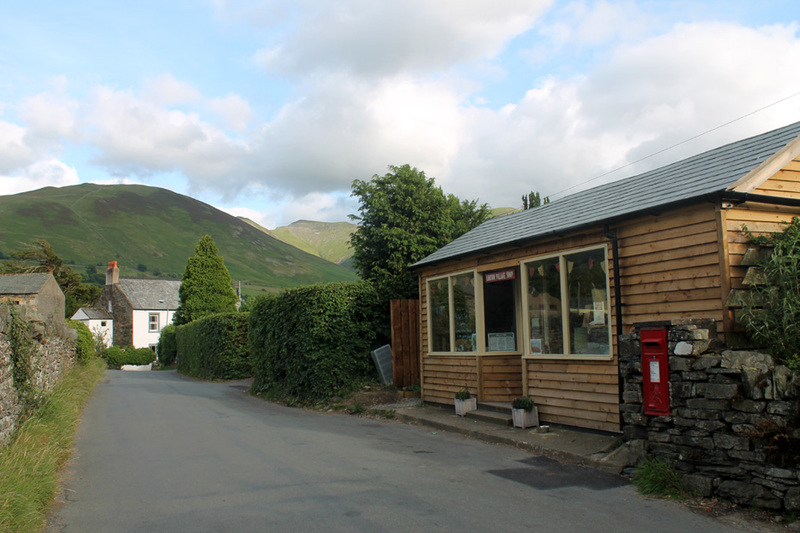 Great Gable, the mountain we saw from Wastwater, is once more in view . . .
. . . as we complete our circuit of the Lakes back at the red phone box in lovely Loweswater. This site best viewed with . . . a pre-prepared dinner waiting to be placed in the oven for a relaxed supper evening for five.